For the longest time, all those recipes that promised you could make bread without kneading seemed to me simultaneously a cop-out and an oxymoron—like nut milks with no dairy, or vegan hamburgers or, for that matter, working holidays. Why leave out the most kinetic, fun part of the entire process, that allows you to playact blue-collar labor, work out your aggression, and show the gluten who’s boss, all at once? But I realized recently that I had missed the point. I had missed the import of one word: autolysis. Bread starts with gluten. Flour has the potential of turning some of its proteins into gluten, that stretchy, strandy thing that binds the air into webs as it rises. Gluten is the cause of the elasticity of dough and for the spongy, soft interior of bread. Gluten is the reason bread doesn’t turn into either a pancake or a brick. Flour, while it is dry and powdery, contains the ingredients to make gluten, but no gluten itself. But as soon as flour particles come in contact with water, a couple things happen. One, in the presence of water, two of the flour’s proteins start to come together to form gluten. And two, some of the starches break down into sugar. If the flour-water mixture is ‘infected’ with yeast, the little yeasties can feed on the sugar and multiply. This process is known as ‘autolysis’. Now most of the wise bread teachers, like Rose Levy Berenbaum and the bakers at King Arthur Flour, have always recommended a period of ‘walking away‘ once you have mixed water and flour before the kneading begins. This walking away, whether it is for ten minutes or an hour, gives the gluten formation a head start, and makes the subsequent kneading a much easier task. Call it walking away or call it autolysis, it is the time for the flour to spontaneously do the gluten-formation that kneading is usually called upon to do. But what if you took this principle to its logical conclusion, and allowed the flour-water to do all the work? What if you never had to knead at all? What you have then is no-knead bread. It takes longer than kneaded bread, because the folding and squeezing that the dough is subjected to while kneading speeds up the process. But as a home cook, I plead—no, I demand—that you develop patience. It will take you a day, or more. But you will be proud of your loaf. Now here’s another advantage that no-knead breads can give you that kneaded breads simply cannot. The dough can be very, very wet. So wet in fact that they are impossible to handle, because touching it with your whole hand as you would have to in order to knead would make a sticky mess. No-knead bread is never handled (with one exception, as I’ll go into next). So it can have a lot more water by proportion than regular breads; and a wetter dough makes for a softer, more risen, more holey crumb. Now the dough is so wet that one even foregoes the usual ‘freeform’ baking of the crusty loafs, where they sit in the oven all by themselves. The dough is simply too wet! This is why the standard way to bake this kind of bread is in a covered dutch oven or a loaf pan. (I’ll show you both by-and-by). The added advantage of this method is that in the closed, wet, hot environment of a dutch oven, you essentially create a steam sauna for the bread, and get a simply remarkable final rise—while baking. Step One: Fold in the left third of the rectangle in order to cover the middle third, then fold in the right third of the rectangle in order to cover the previous flap. Step Two: Rotate the dough 90° and repeat the two folds above. You have considerable flexibility regarding ingredients. Where the flour is concerned, you can go up to one third whole wheat. I’ve used high protein bread flour, but all-purpose will work too, though the result will not be as chewy, but rather, softer. 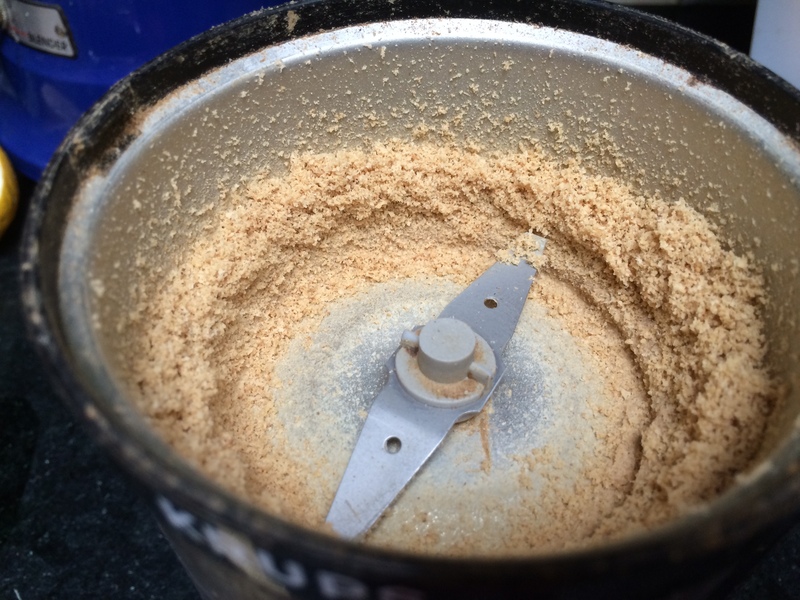 A single teaspoon of salt will be just enough for the bread to taste ‘normal’ but you can go up to even two teaspoons for a saltier crumb. Using less yeast then a quarter teaspoon will make it rise slower, more will make it rise faster. Though I would not recommend more than a half teaspoon because remember, you want this process to be slow. 10 minutes folding and shaping. Combine the first three ingredients in a large bowl and combine thoroughly with a fork. Make a sort of well in the center and pour a cup and a half of water into it, reserving the two extra tablespoons to add if needed. Roughly combine using a chopstick till ALL the flour is moistened. Add in the extra water if needed to make sure there is no more dry powdery flour in the bowl. A wet, sticky mess is what one is aiming for. 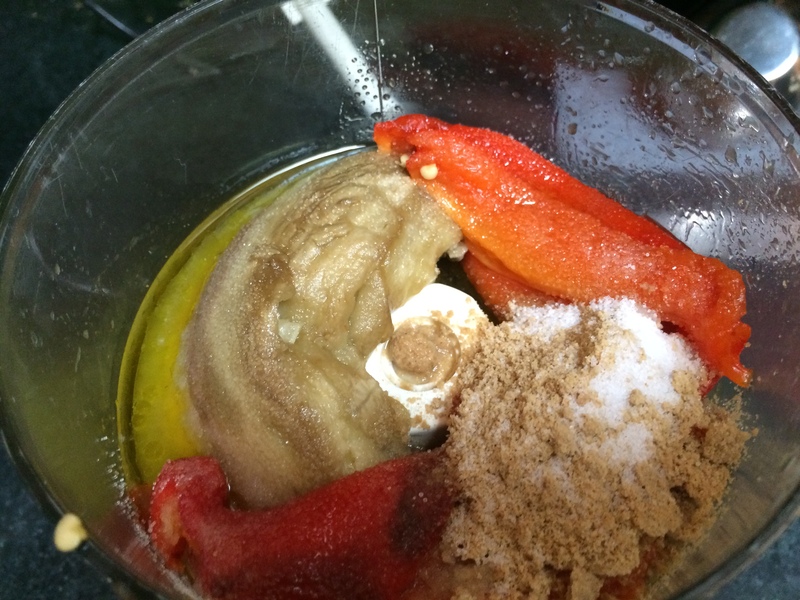 The resulting mixture will be very, very rough and sticky. Scrape down the sides of the bowl with a spatula, wrap tightly with plastic wrap and leave aside. In about an hour or two, you are ready to fold the dough as described above. Sprinkle the counter with plenty of flour and scrape the dough out of the bowl onto the counter. Sprinkle dry flour on the dough as well as on your fingers, as this will help you handle it without it sticking. Perform the two folds as described above. Now the dough will be a much smoother, tighter roll than the mass you started with. Place it back in the bowl, covered with wrap, to rise. This rise can take anywhere from 8 to 18 hours. If it is rising too quickly and you are not ready to proceed with the next steps yet, put the bowl in the fridge to retard it. Take it out the next morning and let it come to room temperature, about an hour or two. At the end of this period, the dough should have more than doubled, and the surface should show some large bubbles. If you tap the bowl, it will shiver like jelly. Sprinkle the counter with more dry flour and place the dough on it and proceed to shape it into a round. This is done by pretending you are making a cloth bundle with the dough: so gather the edges into the middle, tighten, and do it some more. Not only is the dough turning into a tight ball, the outer skin is also getting stretched. Place it seam side down on some floured parchment paper. Cover with plastic wrap once again and leave to rise. You can leave it to rise free form, but it is better to place it in a bowl or basket or, as I did, an empty tortilla container. This is so that the vertical sides of the container constrain the dough from spreading outwards, and it is pushed to rise upwards instead. The dough will take about an hour or hour and a half for this second rise. About half hour before you are ready to bake, turn the oven up to 450°F and place the dutch oven, uncovered, and its lid, in the oven to get it hot. At the end of the hour, remove the plastic wrap off the dough. Mist the top of the dough with a fine spray of water. Use a sharp serrated knife to score it: gently, with a slicing motion and barely any pressure at all, make a half inch cut in the top of the dough. A lip will open up, showing all the glorious webbing that has developed under the skin. Scoring in this way helps the crust, as it bakes, to open up along that line instead of haphazardly. Lift up the dough ball, parchment and all, and place in the dutch oven and cover with the lid. Bake for 30 minutes covered and 15 minutes uncovered. At the end of baking, the crust should be golden brown and the bread dramatically risen. When thumped on the bottom it will sound hollow. Let it cool for an hour before slicing. 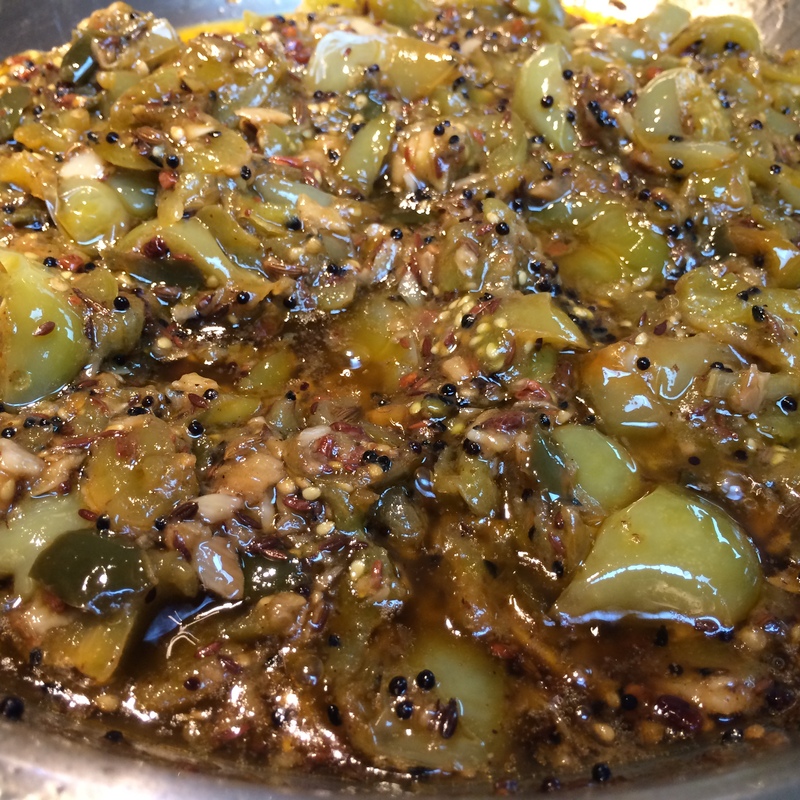 As I have said before, dals are such an integral part of food in India that each type may be used in four different ways: the whole bean, the split bean with the green peel left on, the split bean ‘cleaned’ of the green peel, and ground. And the amazing thing is, that at each of these stages, the cooked dal presents a different look, a different flavor, and a different meal entirely. Let’s take mung dal. Now this is the most basic of the dals, the cheapest, and the earliest introduced in childhood. One dal, so many meals! 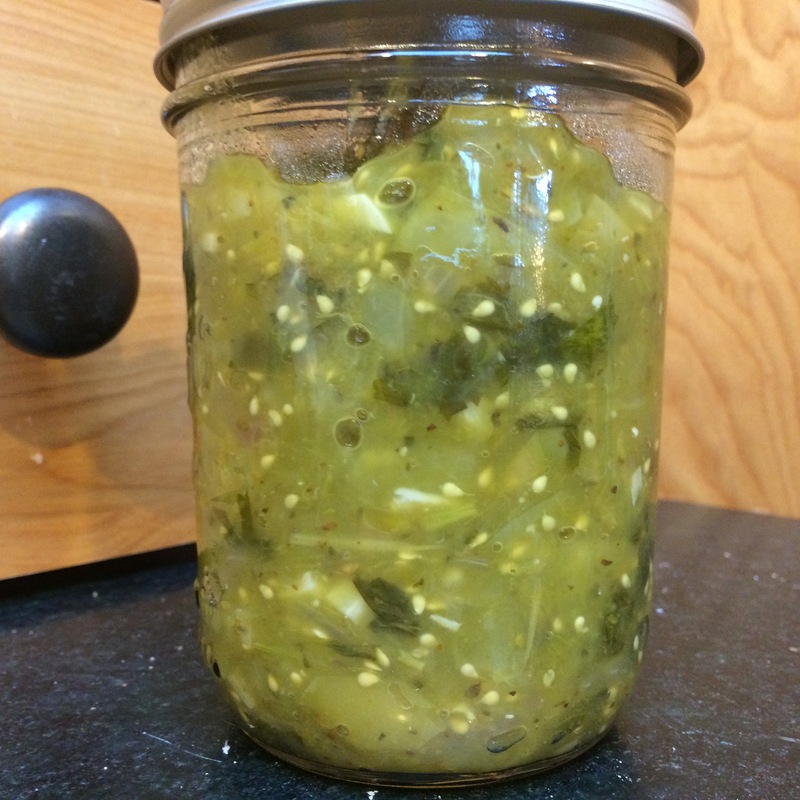 The whole bean can be sprouted or boiled without sprouting; either way, it stays whole, earthy and chewy. The split-and-cleaned dal is yellowish and makes a creamy end-product when cooked. Ground, of course, it can be used to make crepes and pancakes, known as adai in the South. 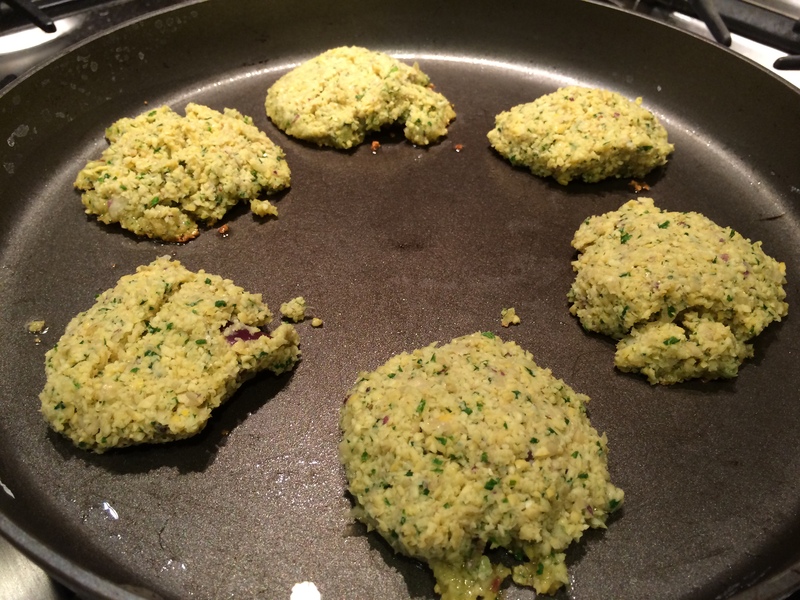 The split-dal-with-green-peel occupies a place somewhere in between all of these methods. Creamy, though not completely mush; earthy but not entirely; a nice meal with roti for cold nights. My family comes from Sindh which is now lost to Pakistan. If one were to ask me what sets Sindhi food apart from the rest of Indian food, I would say, that it is our extremely vague way of naming dishes. 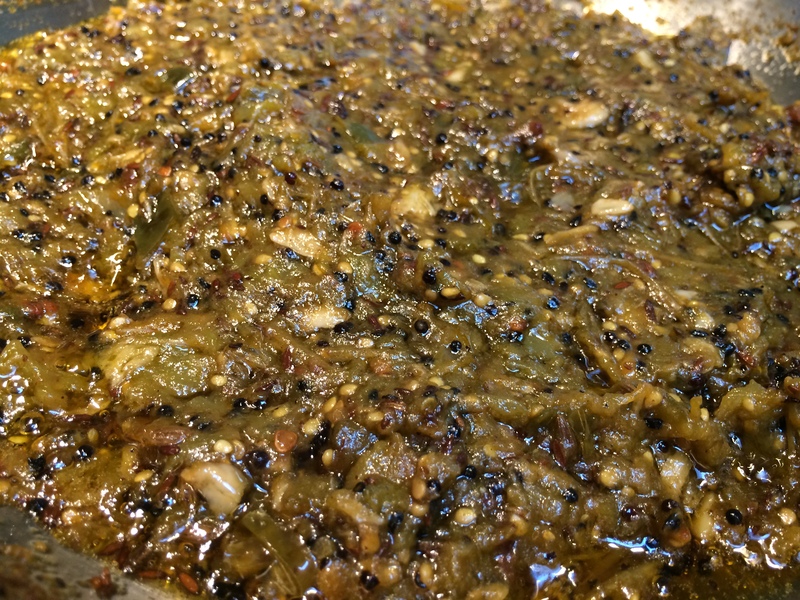 For instance, a gentle stew of split-green-mung dal with some garlic is known, simply, as ‘sai’ (green) dal. Everyone knows what you mean. What’s the point of being more specific? In our family this was a very frequent lunch or dinner side, that went with chapati (roti) and a vegetable. If you want to add a pickle to the meal, I won’t complain. The flavor is the very essence of savoriness, with a slightly ‘rough’ mouth feel due to the peel still being left on the mung bean. Plus, you get the fiber which is no small thing, especially in such a delicious way. Wash and drain the dal. Empty it into a pot that is big enough to allow for expansion of the dal’s volume as it cooks. Add two cups of water along with the turmeric, the tomato, roughly chopped, and the minced green chili. 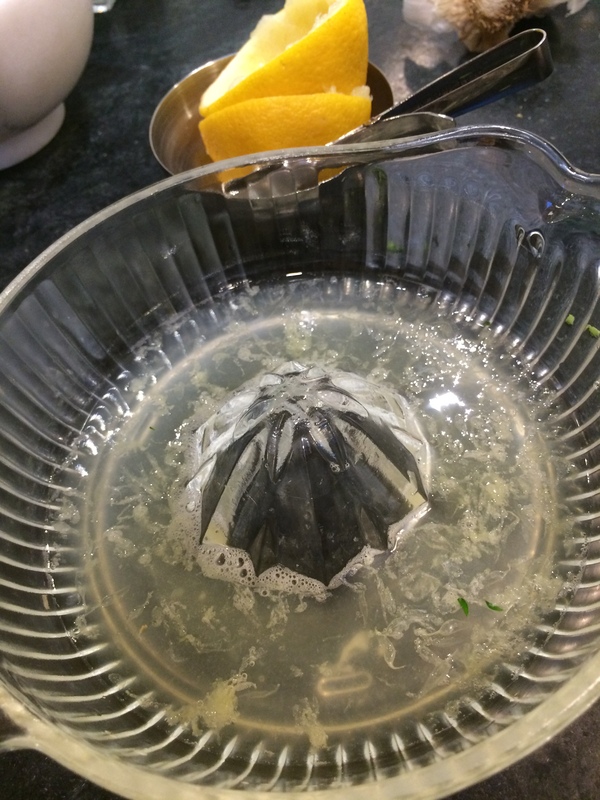 Bring to a boil with the lid mostly off to allow for surging of steam that usually happens when dals cook. 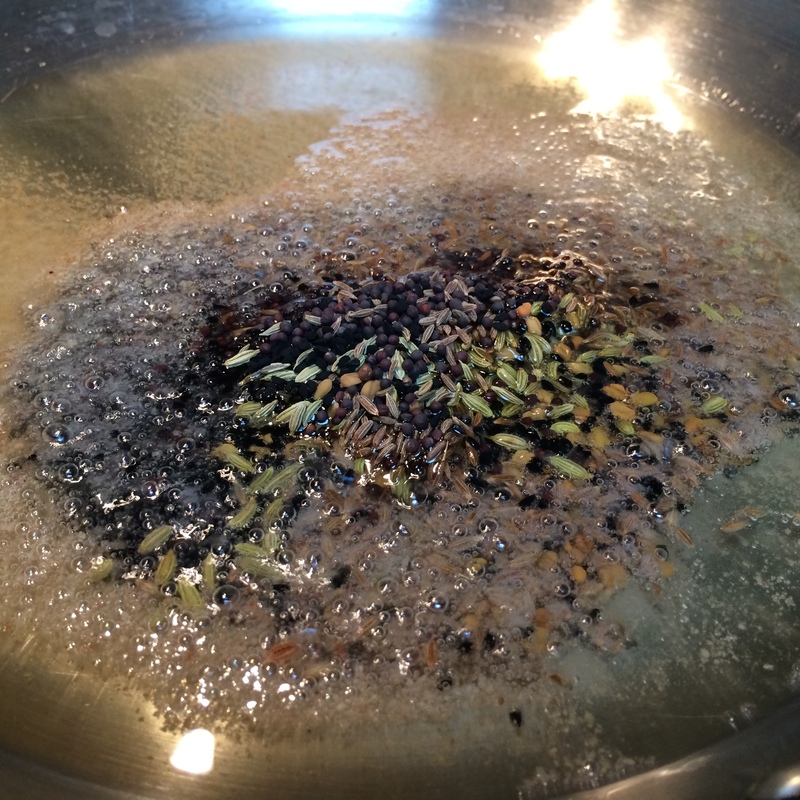 After it comes to a boil and the surge is done (around ten minutes), cover and turn the flame down to a simmer. In around 40 minutes the dal will be softened. Add the salt and turn off the flame, leaving the dal covered. Meanwhile start the tempering process. Heat oil in a small thick-bottomed pan on medium-high heat. 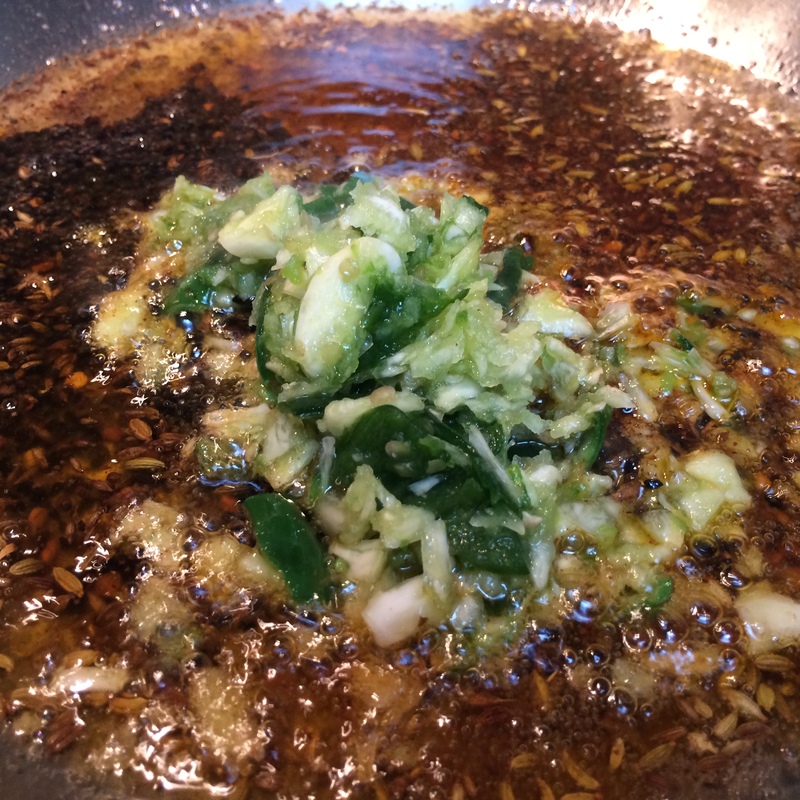 When it shimmers, add the cumin seeds. They should sizzle right away. Add the garlic, and wait until it shrivels. Add the curry leaves, if using. Add the red chili powder; this only needs to cook for a few seconds. 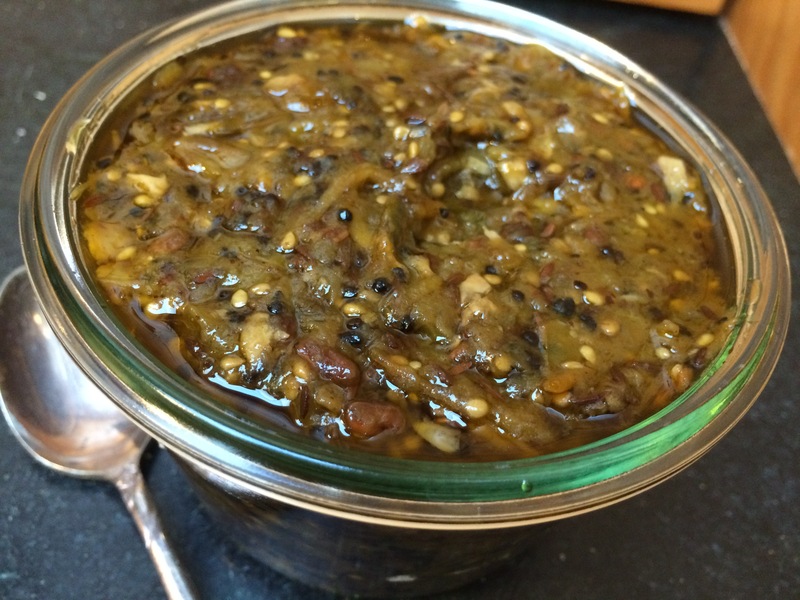 Turn off the heat and pour the seasoned oil over the dal, and stir in to meld the flavors. There are people who like ginger, and there are those who don’t. Both are within the bounds of normalcy. But then there are people who like ginger beyond all reason and sense. My husband is one of them. He is not satisfied with a ginger-flavor suffusing the food; it must have that, and also ginger sticks in addition, so he can actually taste it. It’s pathological, as Donald Trump might say. So if there is anyone in your life with a similar addiction, here is a recipe to finally satisfy them. And stop them complaining! That alone is worth the price of a good piece of fish. To everyone’s astonishment (and relief), this meal actually has more to it than just ginger. The base is a poached fish: it could be halibut, or cod, or other white fish. Most people recommend very subtle accoutrements for poached fish in order to not drown out its mild flavor; but that is not what I did. As is my wont, it is often the seasoning that is the highlight of a meal, and the poached fish performs the function here of a nice inoffensive background. Now for the seasoning. For this dish, I used two dressings, layered one on top of each other. Both use elements from the sort of Pan-Asian cuisine that is popular here in California, with flavors of sesame and soy. 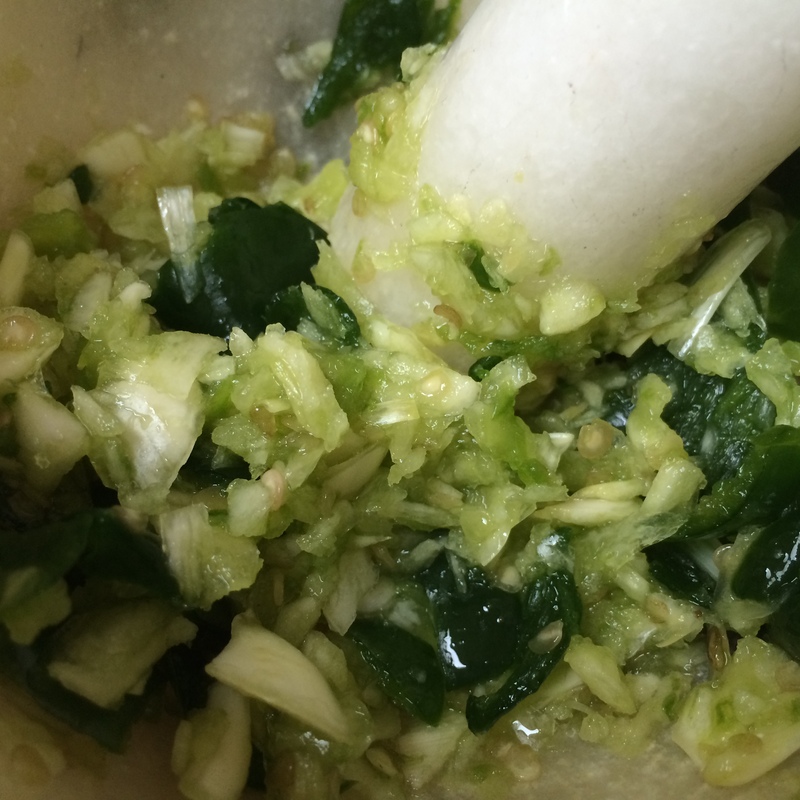 Both dressings use the same trio of scallions, chilies and ginger. The first dressing, which is simmered in soy, has these items minced fine (on the left). While the second dressing, which is fried in sesame oil, has the chilies whole and the ginger in long sticks (on the right). The poached fish, with both dressings layered on, makes a wonderful side for rice. Heat water with salt added to about 160ºF (a simmer, less than a boil). Place the fish in it and poach for about ten minutes. Meanwhile prepare the soy dressing. In a small pot, combine the ingredients and bring to a boil. Lower to a simmer and let it reduce by about half. Once the fish is done, place it in the serving platter. Pour the soy dressing over to cover it everywhere. 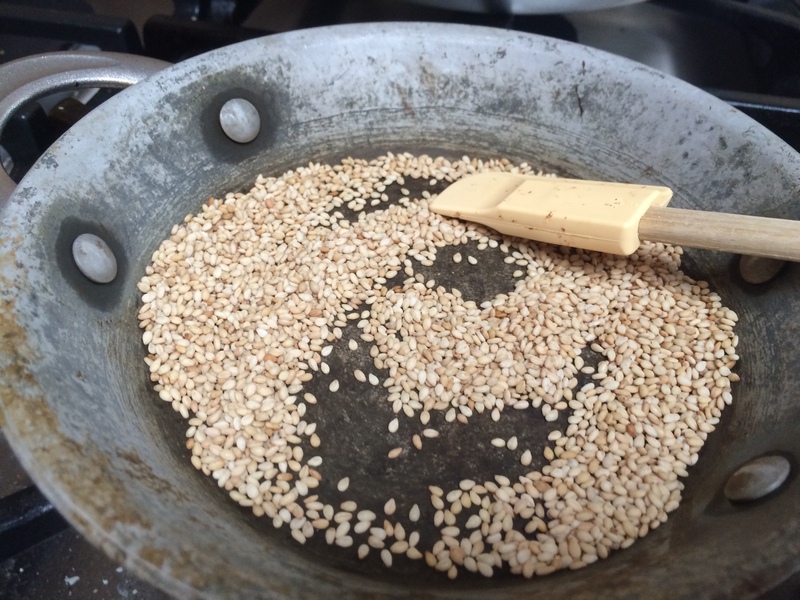 Heat the sesame oil until it shimmers. Fry the ginger sticks and red chilies until the chilies darken and the ginger sticks shrivel a bit. Pour the hot sesame oil over the fish evenly all over it. 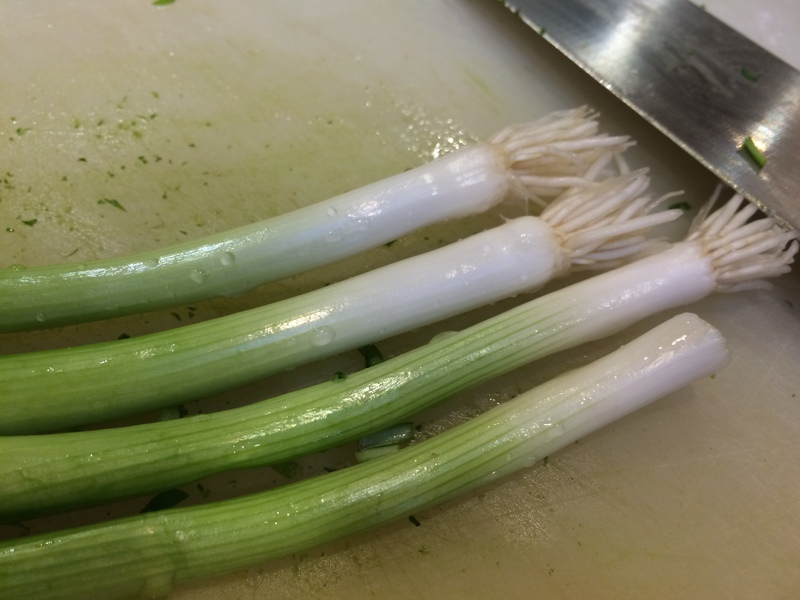 Cover with the green scallion garnish. Serve with rice on the side. Folks, I love my adopted city San Francisco, I really do. I love its hills, its fog, its MUNI and its BART, its rolling jagged windy roads, even its urinaceous sidewalks (with reservations). But really, if there is one thing San Francisco simply cannot pull off, it is ripening a frigging tomato. And yet, in a textbook example of insanity, I keep growing them year after year, hoping that this will be the year when a perfect storm of global warming and sheer willpower will turn those multitudes of green globes red. Wouldn’t that be nice. But no, San Francisco does not oblige. First, the bush grows wildly, flowers and fruits luxuriantly, and the little berries grow into globes. But they stay green. Even my backyard squirrels sniff at them. 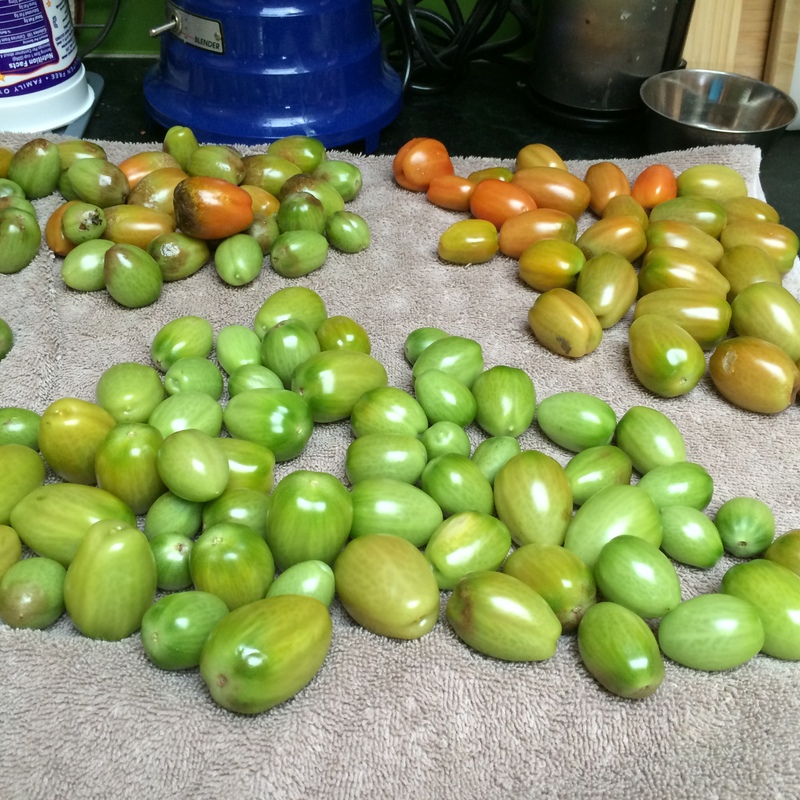 So I have a bush full of green tomatoes, and an impending case of late blight nipping at my heels. If I don’t rescue my green tomatoes now (some with a faint blush on them), I will lose them to the greasy blackness of blight. 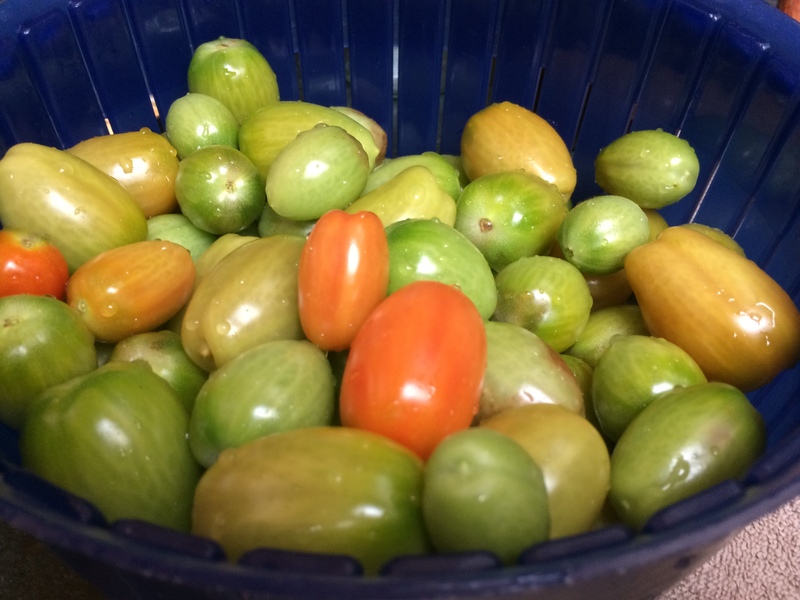 So I harvest them, and now I have a basket full of green tomatoes. What do I do with them? So now we come to the fun part. There are certain options. 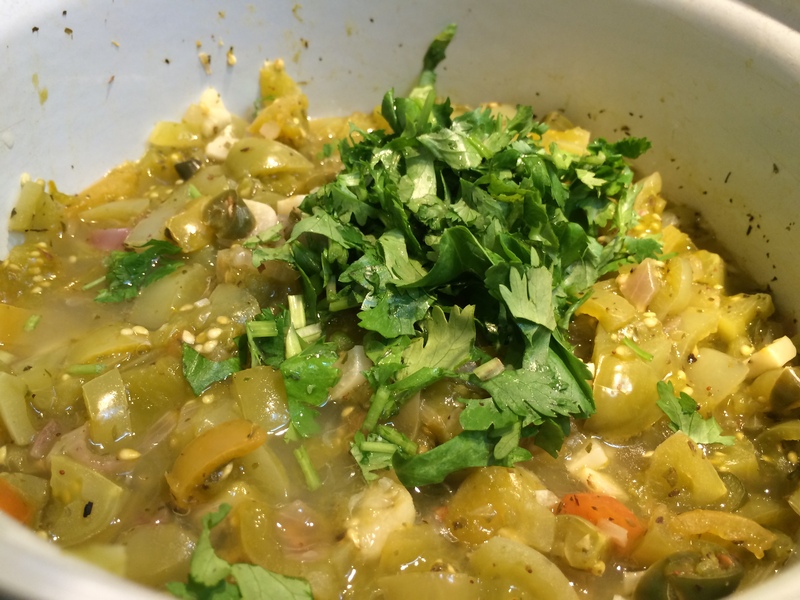 Here is Salsa Verde, in my next post I will explore another one. California is replete with Latin American culture and food, for which I am very grateful. 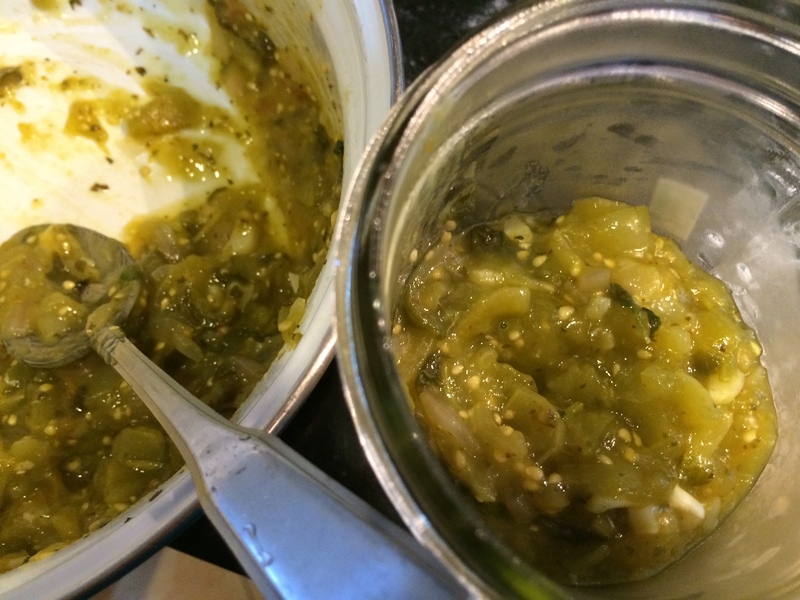 It is hard to describe the tastiness of pairing earthy rice and beans with these ‘sauces’ or salsas — some cooked, some fresh; some red, some green. 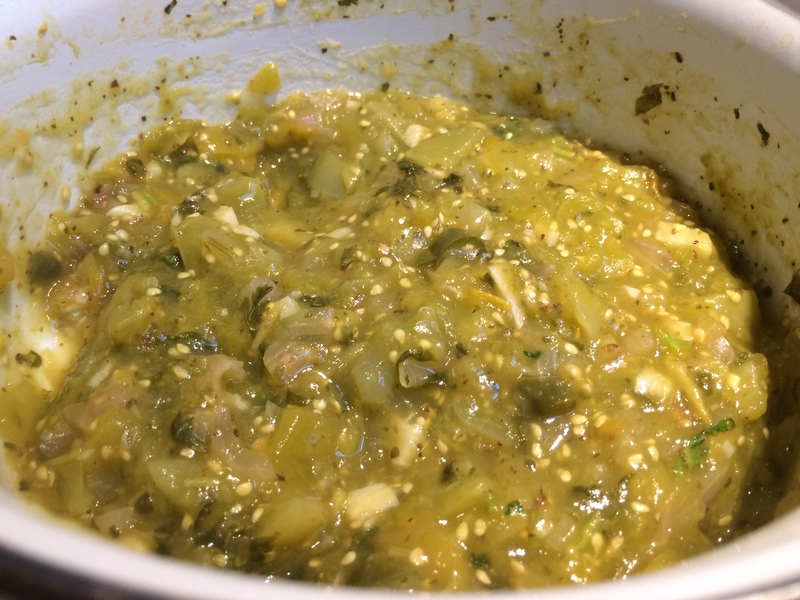 One of my favorite ways to dress a Mexican meal is with the triumvirate of guacamole, salsa fresca and salsa verde. 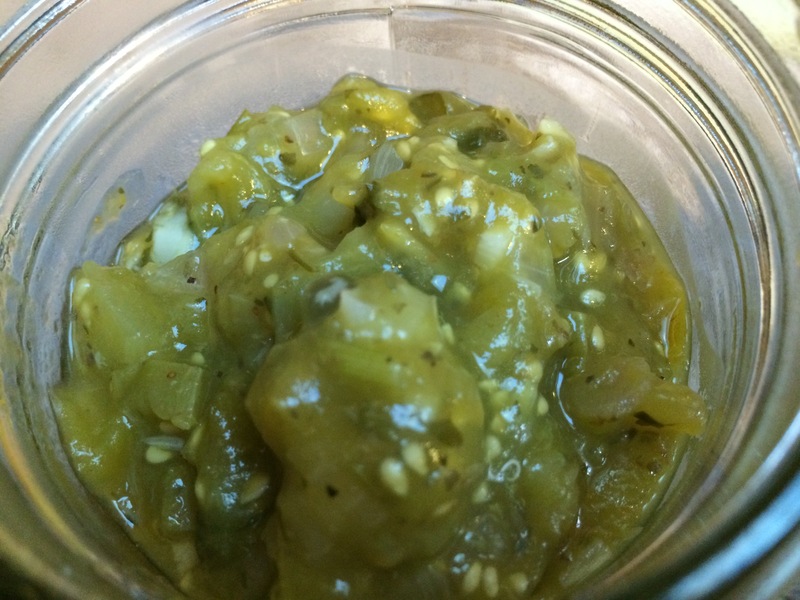 The ‘verde’ means green, and usually the color is imparted by the tomatillo, which is a cousin of the tomato, but green tomatoes do just as well. 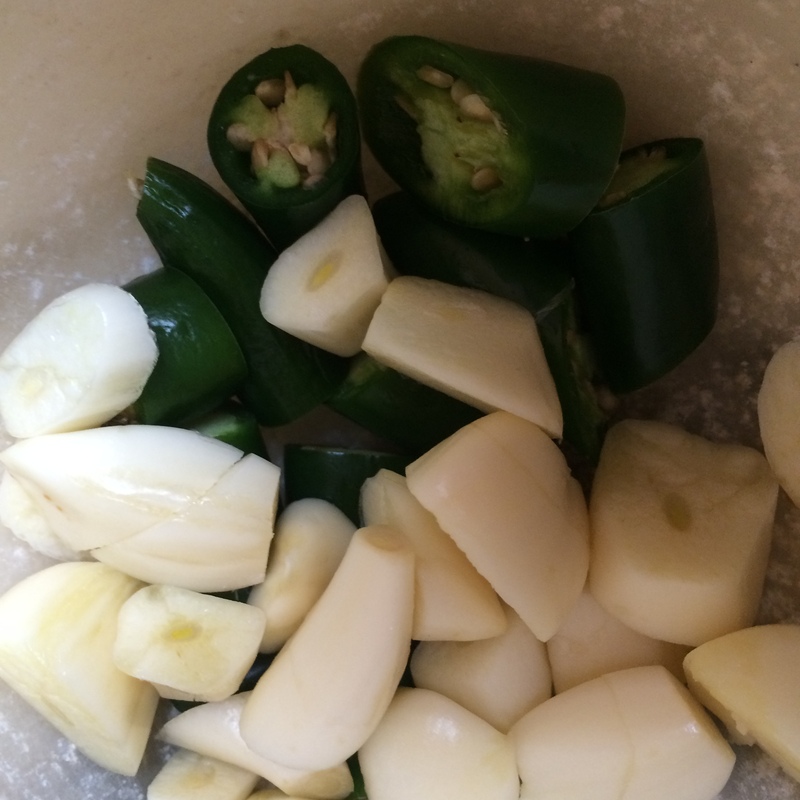 Put everything except the cilantro and lime into a pot and bring to a boil. Cover and cook on medium-low heat for about 10 minutes. Uncover and check if it looks mostly liquefied, if not, cook for another 5-7 minutes. Mash roughly, add cilantro and lime, cook covered to meld flavors for another 5 minutes. Serve as a side with chips or any Mexican meal. My love affair with eggplant continues. Any confirmed eggplant haters would be wise to click away now. 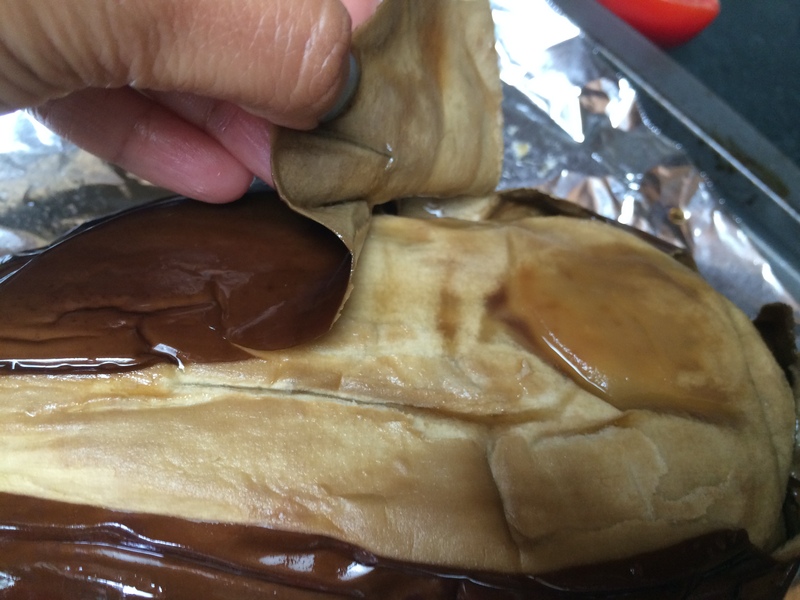 This blog has become nothing but a vehicle for eggplant worship — maybe I should rename it ‘The Odd purple vegetable in your Pantry’. In any case. The other love affair I have is with mashing things. Now the very word ‘mash’ arouses deeply unfashionable images in the foodie mind. Perhaps images of an eater who has lost their teeth or not yet grown any; or of overcooked and limp strands; or perhaps images of hospital trays with their scanty TV dinners. But it is time for mashes, and their French cousins, the purées, to get some respect. There is no other method that combines flavors as well; and if some fat is added, as it is in this recipe, the mash gets a sheen and a nice mouth feel. 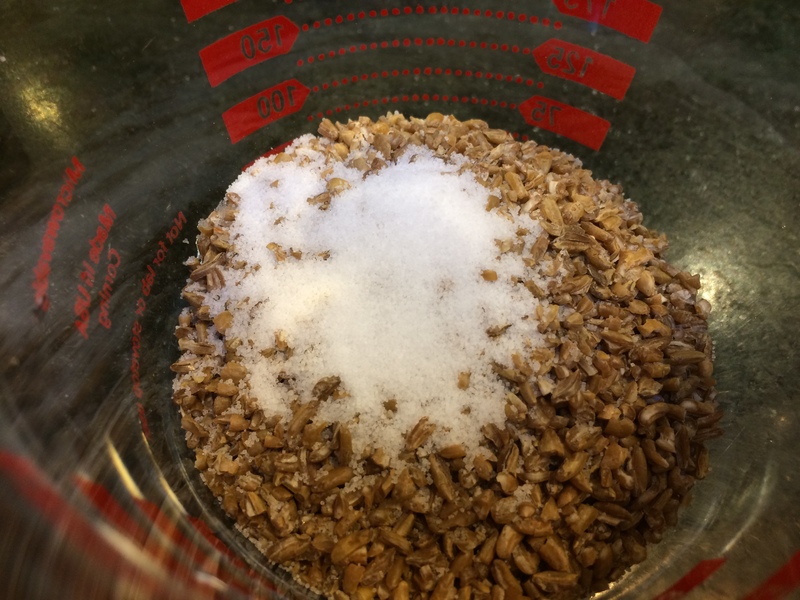 If the ingredients that go into a mash marry well, there is no reason to scorn it. Plus, there is the thrill of pulverizing ingredients together — many adults have attested that their early love for cooking came from the thrill of mixing things up just to see what would happen. Or, you can call it a ‘dip’ and feel fashionable again. 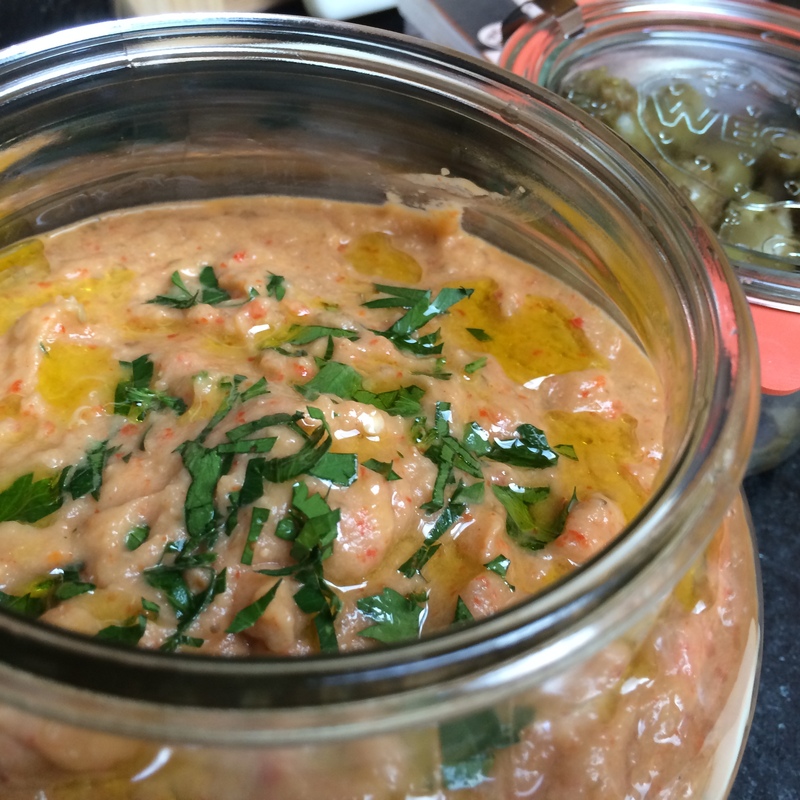 Now for the pampered father, or, ‘Baba Ganoush‘ in Arabic. Apparently a sultan in some ancient royal harem in the middle east came up with this particular eggplant mash…or perhaps he just enjoyed it very much, the OED is not clear on this point. Somehow, this pampered, coy father achieved culinary fame that reached across the centuries and empires, all the way to food trucks in contemporary San Francisco. What is this pampered father? 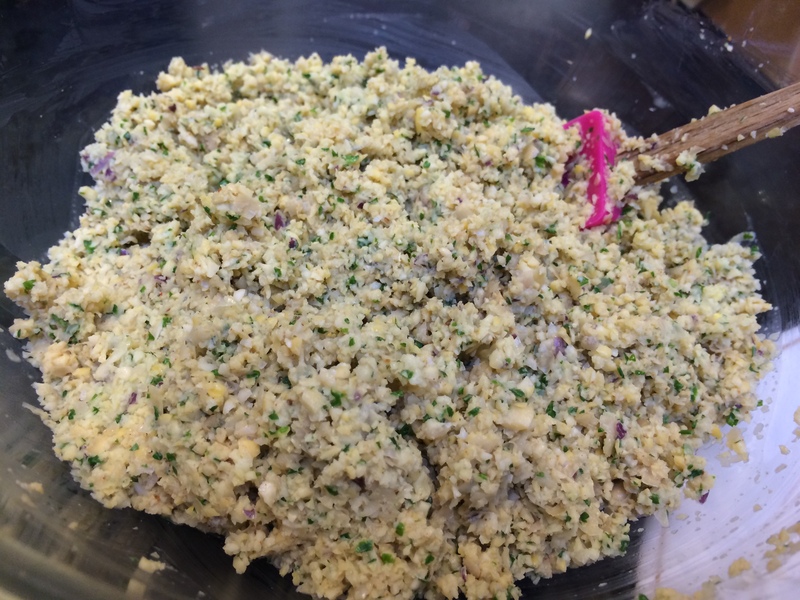 Roasted, pureed eggplant, flavored with ground sesame seeds (tahini), olive oil, lemon, and other flavorings. 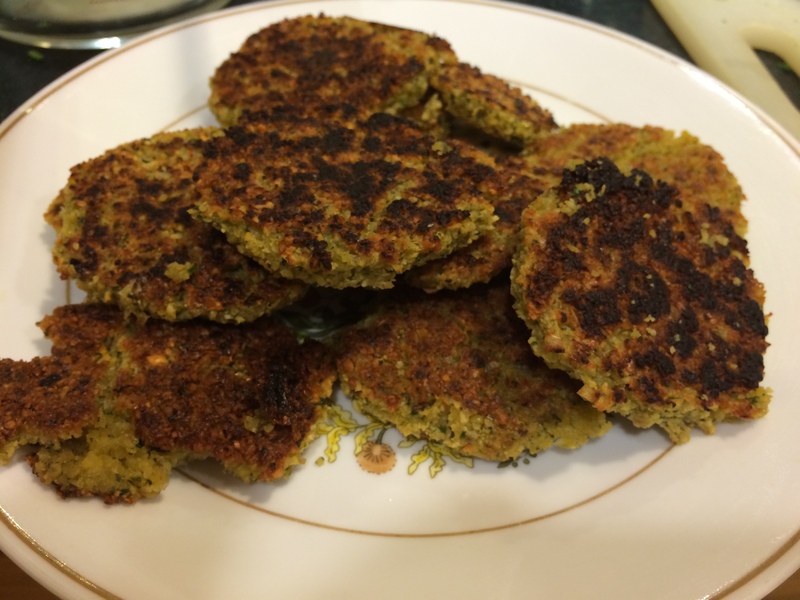 It can be eaten as a snack with pita points, or as a dressing in a felafel sandwich. There is a certain amount of freedom on what other flavorings to add; and here I have chosen a rather unusual addition — that of roasted red pepper. Not only does it add a subtle sweetness, but also little flecks of red. 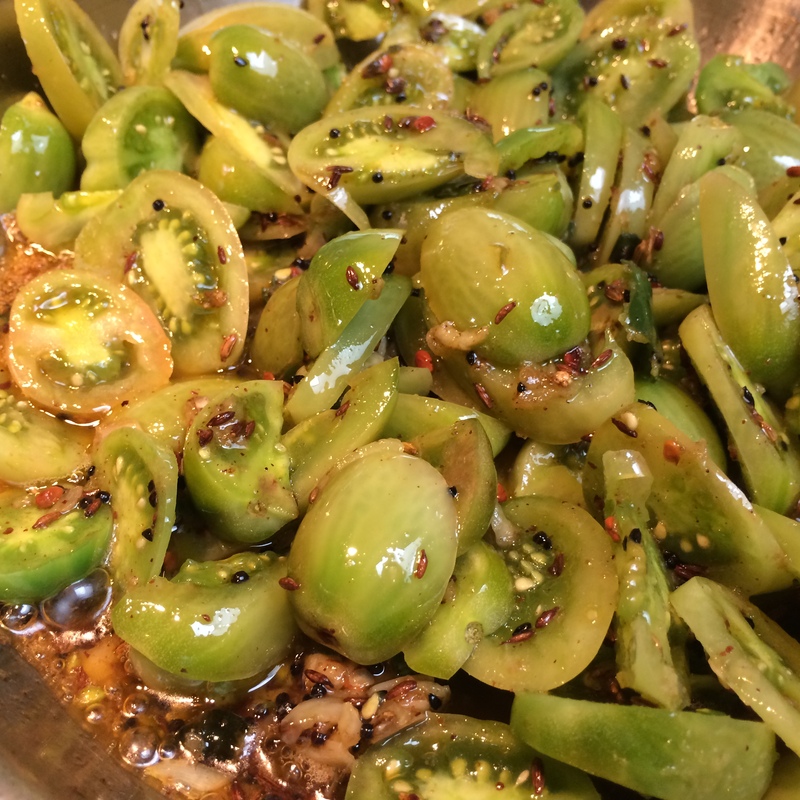 Plus — eggplant and pepper being nightshade cousins, it is a bit of a family reunion. Heat the oven to 450ºF. 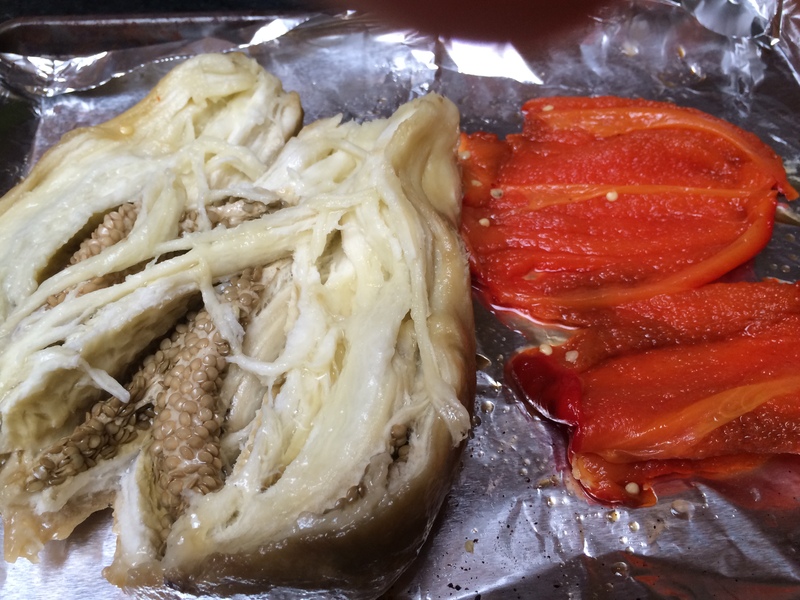 Rub a bit of oil all over the eggplant and bell pepper and place them on a tray and into the oven. Bake them for half hour to forty-five minutes, turning once or twice during that time. At this point, the vegetables will have completely collapsed and be soft inside. Meanwhile, heat a small thick-bottomed pan on medium-high heat. 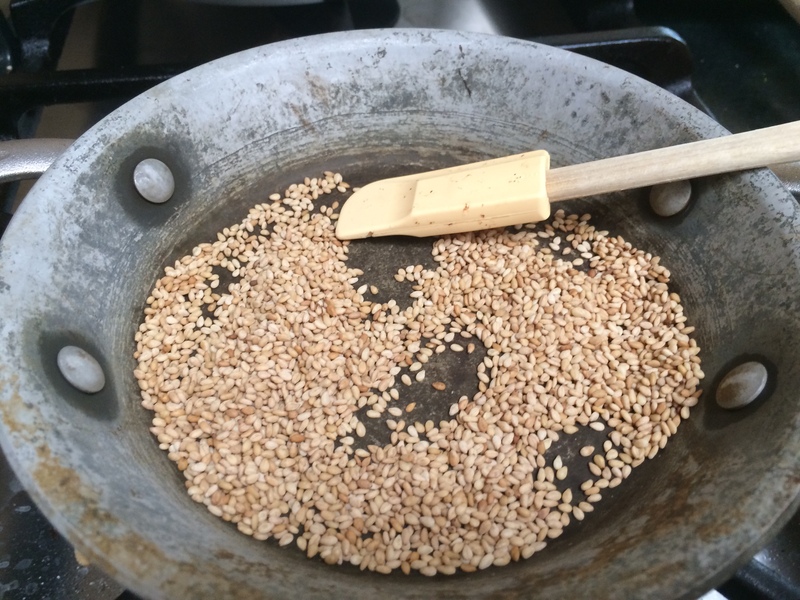 Roast the sesame seeds on it, keeping them moving once in a while. Soon an aroma will arise and the color will darken one shade. Turn off the heat. After cooling them for a few minutes, grind them in a clean coffee grinder. 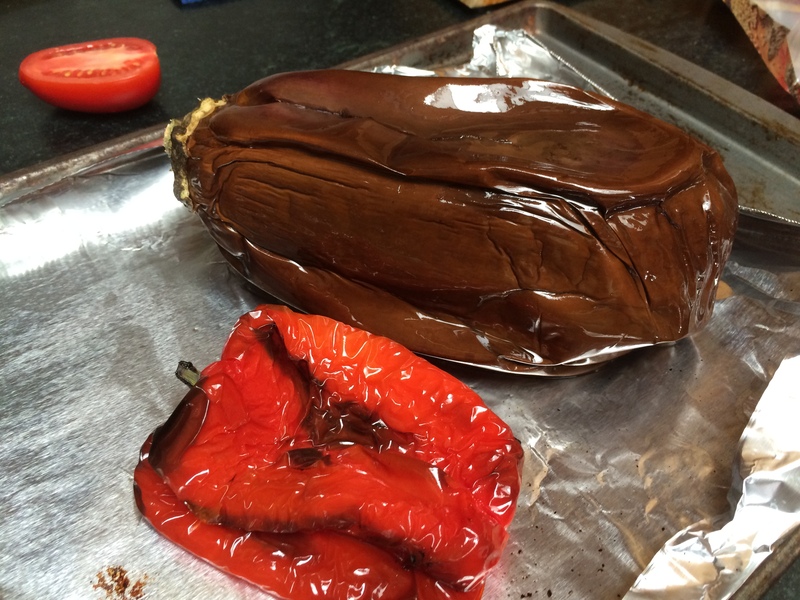 When the eggplant and bell pepper are cool enough to handle, peel them. The skin should come off quite easily due to the baking. Put the flesh, along with the sesame seed powder, salt, olive oil and lemon juice into a food processor and pulse till smooth. 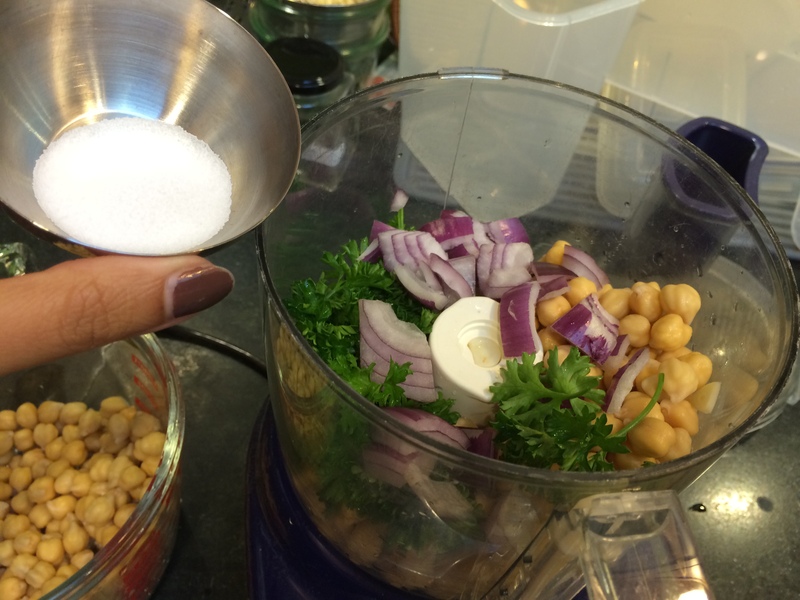 Taste for salt and lemon juice, add parsley for garnish. If you walked down the street around where I grew up in Bombay, say, around noon, you would hear the sonorous pressure cooker whistle sounding out of multiple windows. 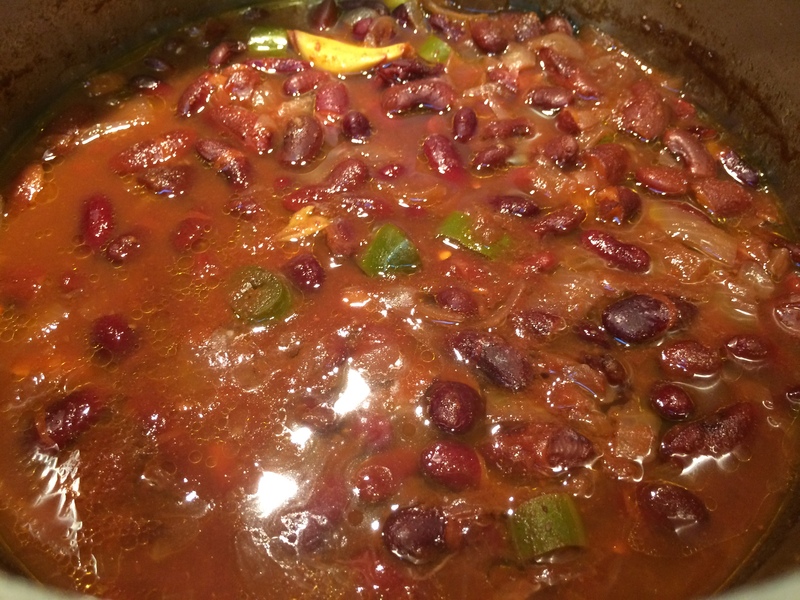 It being lunchtime, every household had their lunchtime dal or beans going in the pressure cooker. Some might be cooking pigeon pea (tuar), some mung beans, or garbanzo beans (channa), or something else. But the pressure cooker was a must. It is so much part of kitchen life in India that sometimes two or three layers of pots go in at the same time, so your potatoes or peanuts can be boiled at the same time that the cauliflower and peas dish cooks, both of which cook together with your lunchtime dal. Cooking time is measured in whistles – most dishes take two whistles. The tough ones go on for three. In my new home though, here in America, I found that the pressure cooker is considered a strange and scary beast. It screams! It is under pressure, it looks like it wants to explode! Most can’t believe the speed with which it does its job, being used to ovens and their longer times. The small, family-sized pressure cooker which can hold two quarts is hardly found in shops, all you find is the industrial-sized seven-quart behemoth that politely raises a tiny yellow hand when ready instead of whistling. 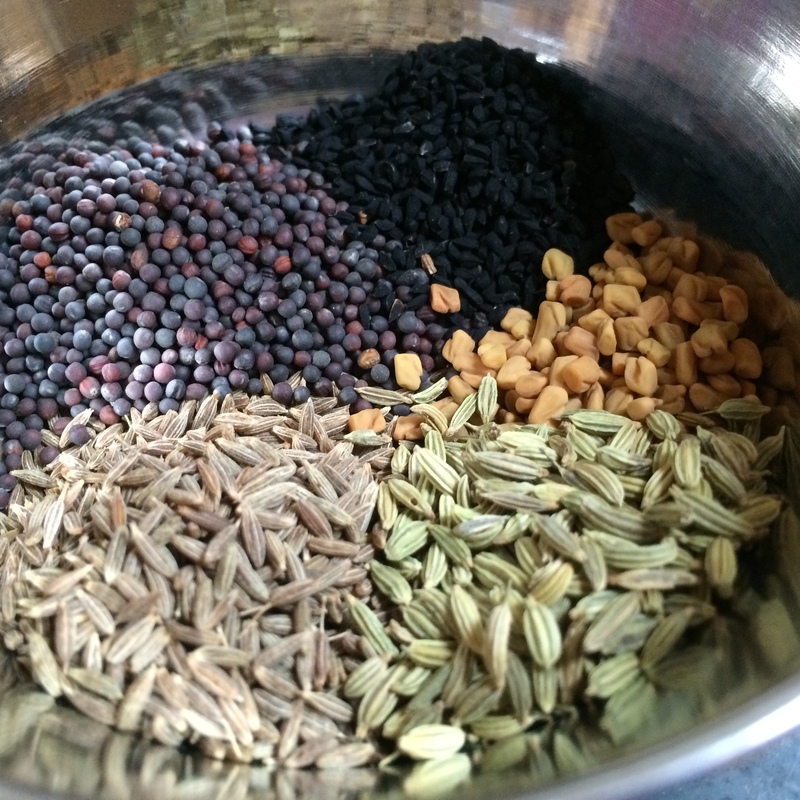 Given the new interest in non-meat protein sources, many evince an interest in the hundreds – possibly thousands – of ways of cooking dal that one sees all over India. The use of the pressure cooker stops many, as well it might, since most people don’t own one. Cooking on the stovetop is possible, but takes so long, and requires so much management, that it isn’t often practical. Well, there goes that excuse. 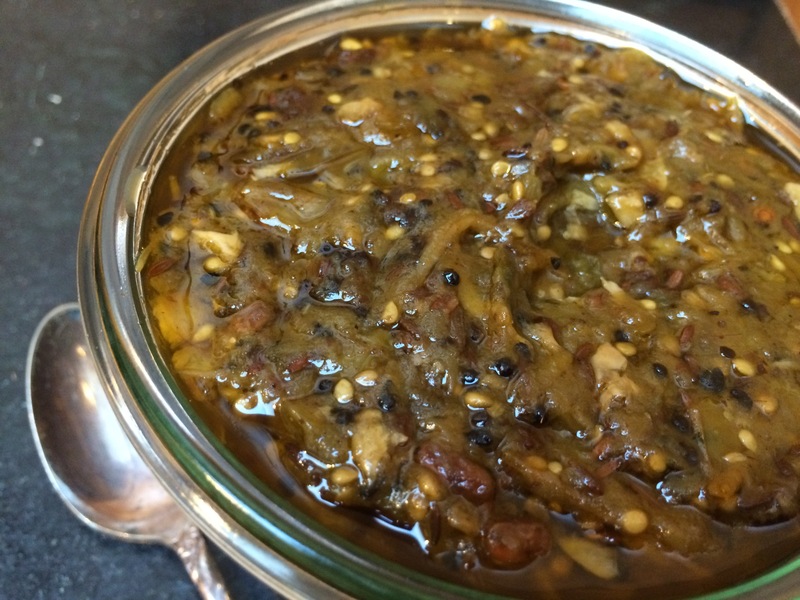 You may not have the two hours to actively manage a stovetop dal, but surely you have seven hours to not manage dal cooking in the slow cooker? When I heard of this method from my friend Daljit, I had to try it. It dispenses with all the usual steps: you do not need to pre-soak the beans, nor do you need to temper it. Put it in, cover it, forget it. Come home in the evening to a wonderful aroma and dinner. One note: slow-cookers are great to have, but the oven can do the job as well. The conversion I use is: six to seven hours in the oven in a sturdy, well-sealed pot (dutch oven) at 250ºF for a slow-cooker set to low, for the same amount of time. 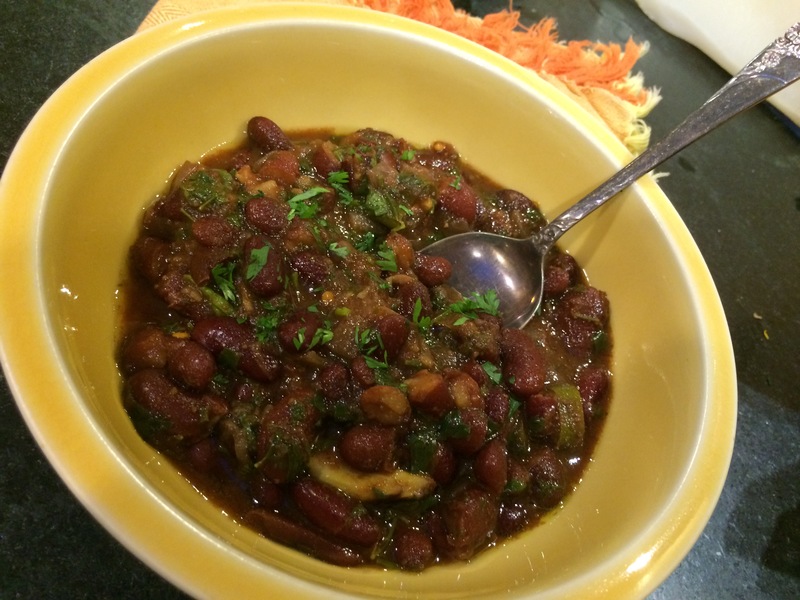 Two of the whole beans most often used by Punjabis are the whole black gram (otherwise known as maa ki dal or urad dal), and red kidney beans (rajma). 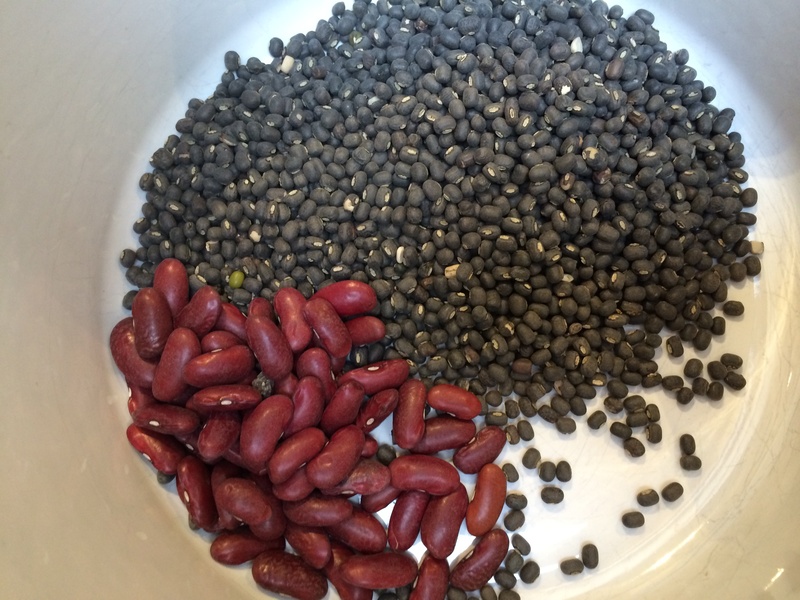 The two are also often mixed, with three times as much black gram as the red beans. 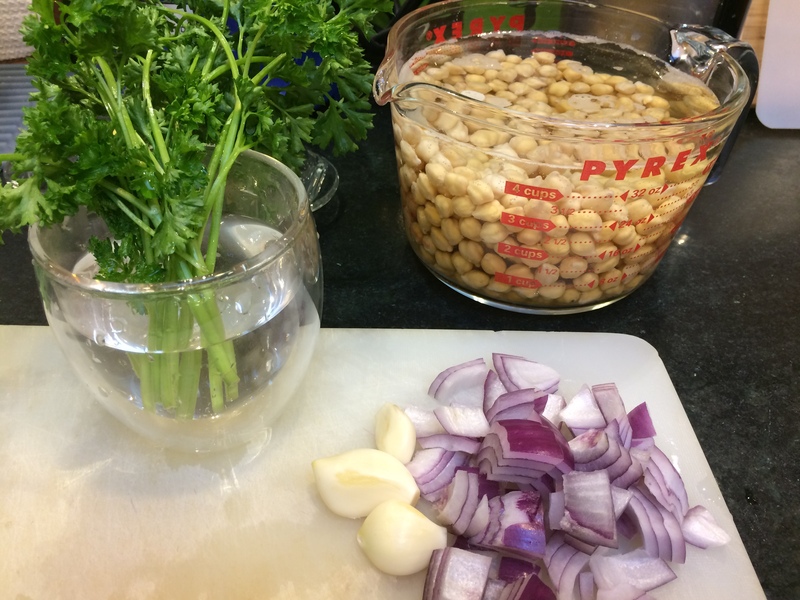 The recipe below can be used for either of these beans, or for that matter garbanzo beans as well; though those sometimes like to be more highly spiced. Preheat the oven to 250º F. Alternatively, get your slow cooker hooked up. 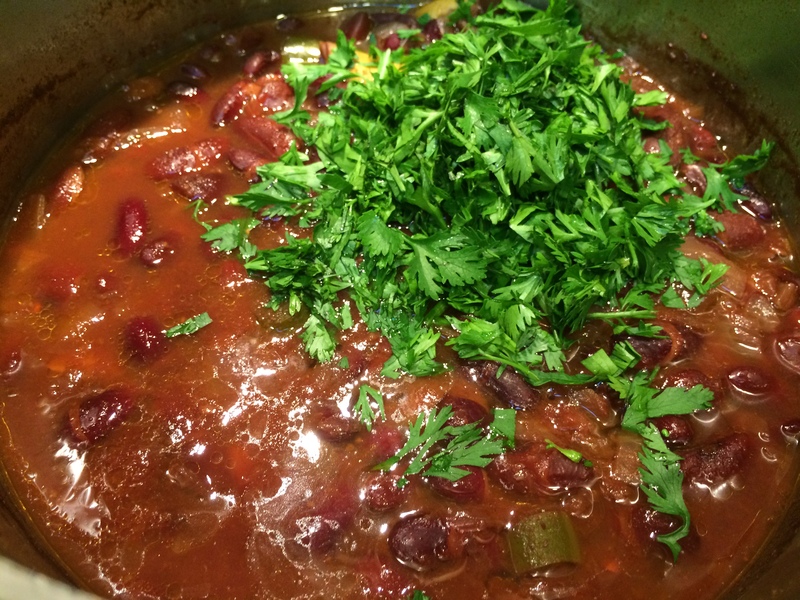 Put all ingredients except the salt and the cilantro into a pot or dutch oven with a tight-fitting lid. There is no need to presoak the beans. 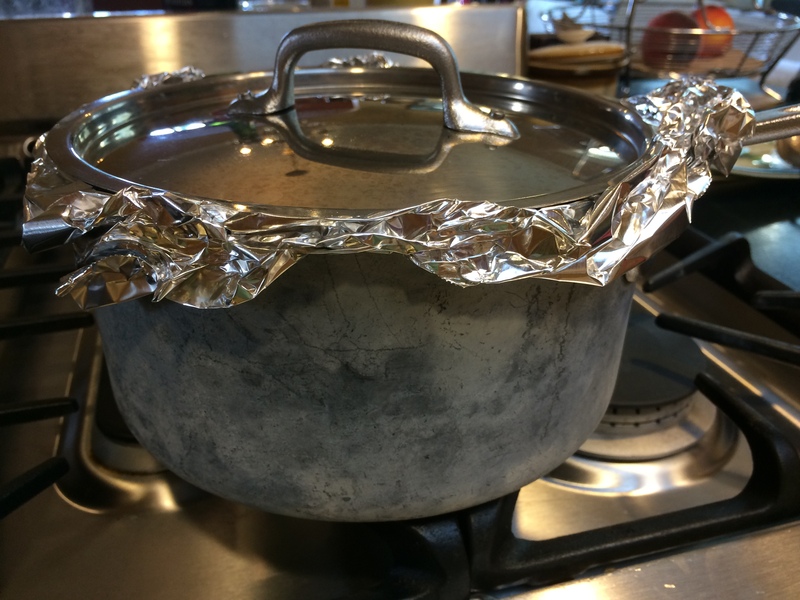 Cover the pot tightly — if the seal is not perfect, you can jury-rig a pretty good one by putting a sheet of aluminium foil between the lid and the pot, and then crunch up the foil edges to block the opening. Soon a lovely aroma will spread in the kitchen. Leave it in the oven / slow cooker for 6 to 7 hours. At the end of it, take it out, add salt and cilantro and stir them in. Garnish with more cilantro if desired. We are on a middle-eastern kick here at The Odd Pantry, and when I say ‘we’ of course I mean ‘me’. 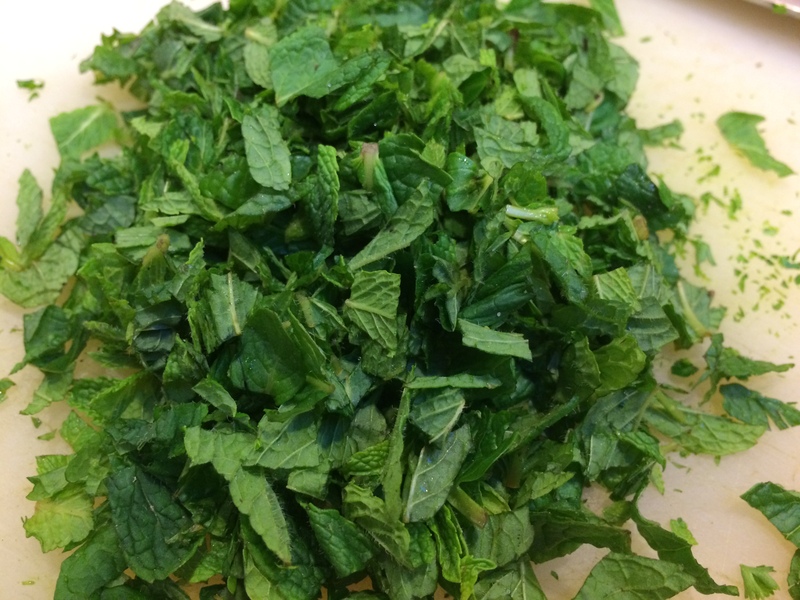 When last seen, your loyal correspondent was flipping falafels like a fiend; this time, let’s take a freshly-scented walk through the tabouli trails, a whiff of mint here, a whiff of parsley there, the tingling freshness of lemon all over. Tabouli is a salad. Originally from the mountains of Lebanon and Syria, it is adopted all over the middle-east now. Unlike most salads here in the West (slaw being the exception), every ingredient is minced to fineness. 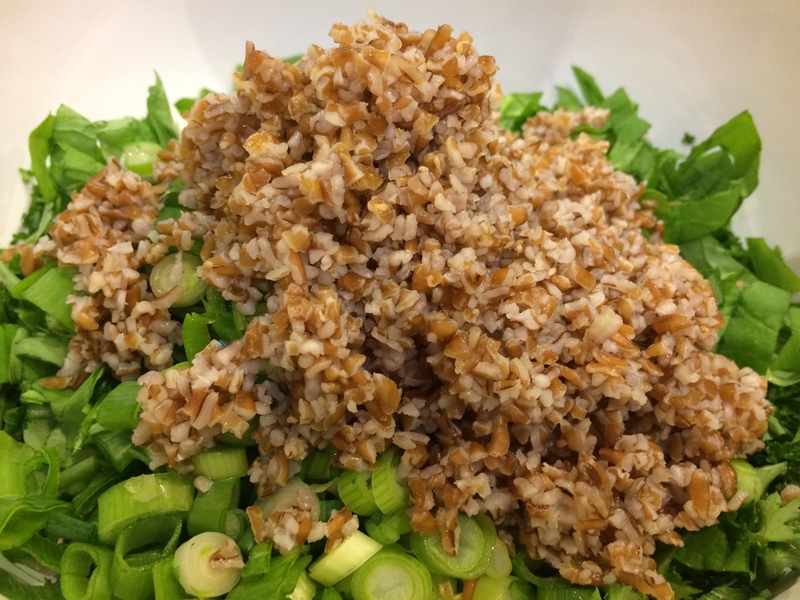 For body and bite, it uses bulgur wheat that has been plumped up in hot water; I’m not aware of any Western salad that uses grain in a similar way. 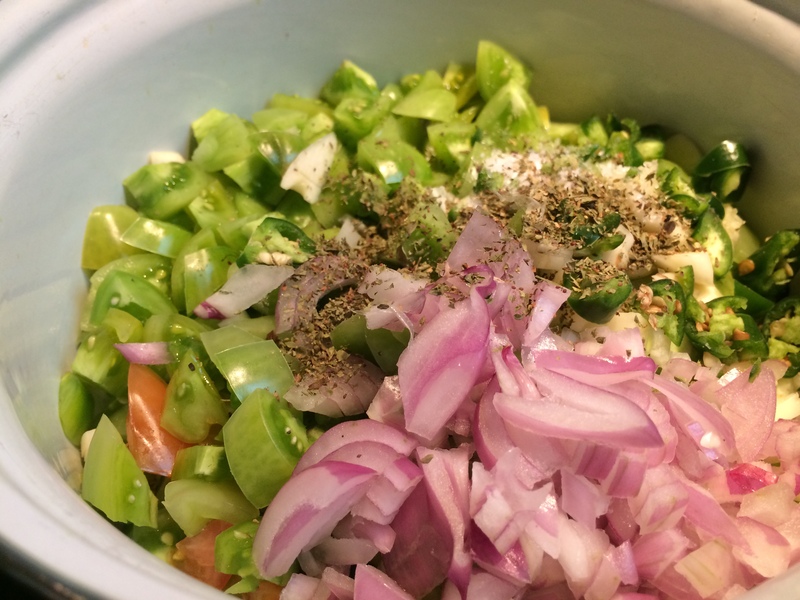 The dressing is not premixed, but rather, each ingredient is poured on and mixed in thereafter. 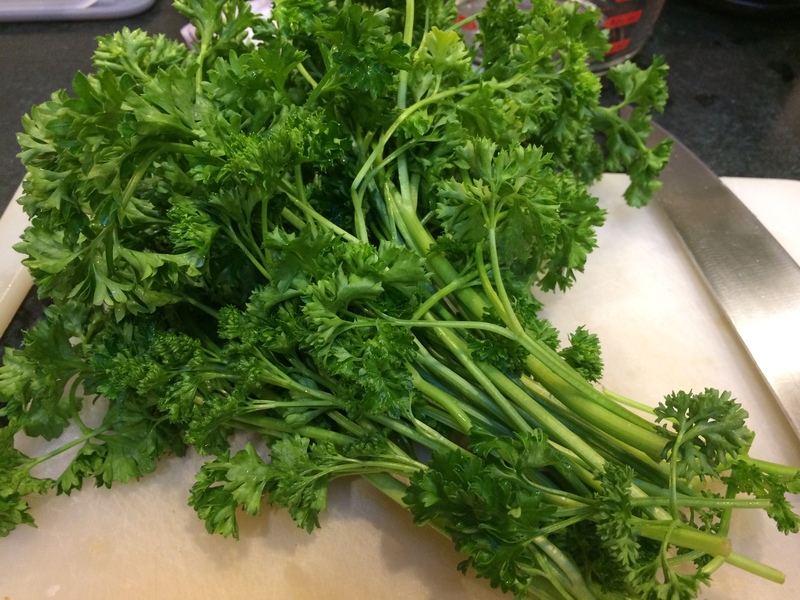 And parsley — that sprig that is pushed to the side of every restaurant meal in America — that parsley plays a starring role. I called it a salad, but it in the middle-east it is considered part of mezze, a kind of smorgasbord of appetizers. When it is part of a mezze platter it may be served on lettuce leaf boats. Or it might be considered a side or condiment to be stuffed inside pita bread along with other ingredients. I personally can eat a plateful all by myself. 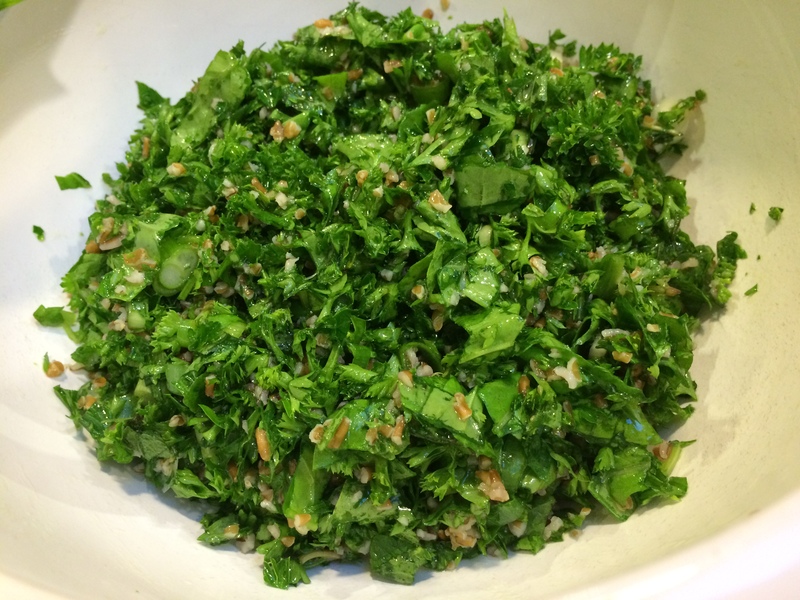 Tabouli is the descendant of an ancient Arab love of herbs, which they called qadb. 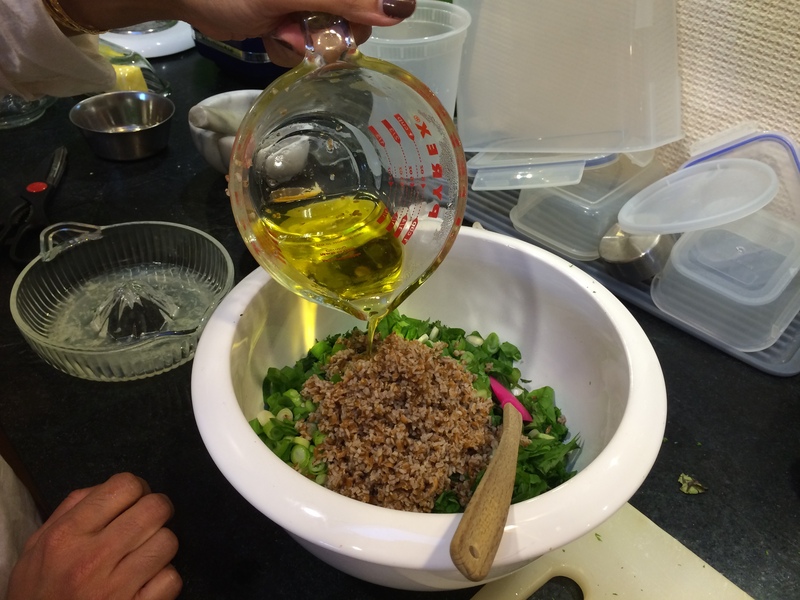 And the very word tabouli comes from the word taabil meaning seasoning. What I am trying to say is, do not skimp on the herbs. The bulgur grain plays an essential but minor role, while the parsley and mint take center stage. Make sure to salt well, and lemon juice is your friend. Also, make sure to dry each ingredient scrupulously. The herbs might be washed, then spun-dry, then laid flat on a towel to air-dry. The bulgur must be drained well. 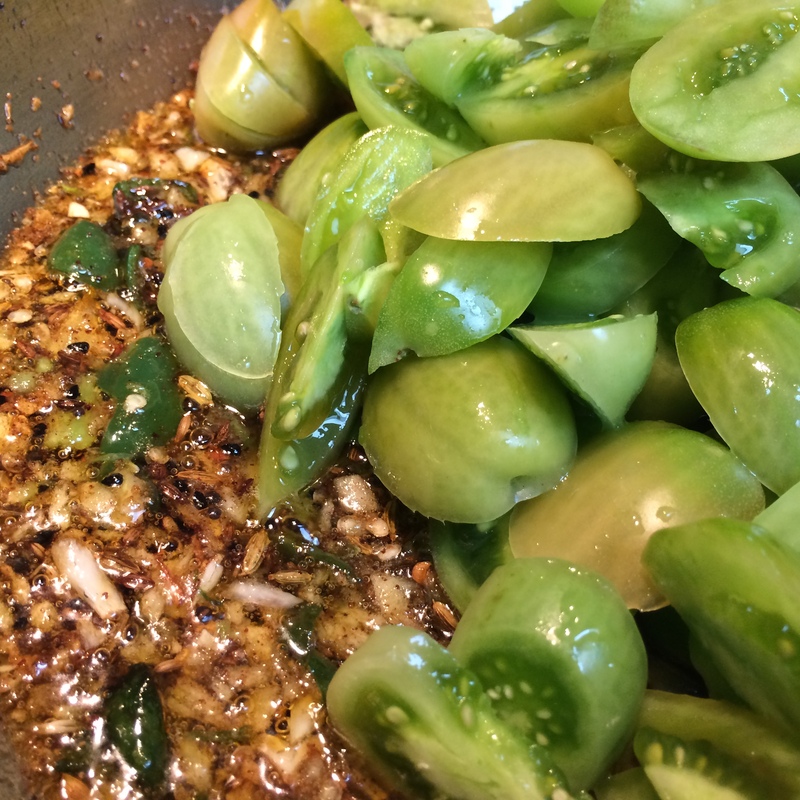 Tomatoes can be finely chopped, salted lightly and placed in a strainer to drain for ten minutes. Armed with these notions, we are ready. Before you begin, soak the bulgur and salt in half a cup of very hot water. Leave it covered, undisturbed, for half an hour. The grains will slowly swell up to the water line. 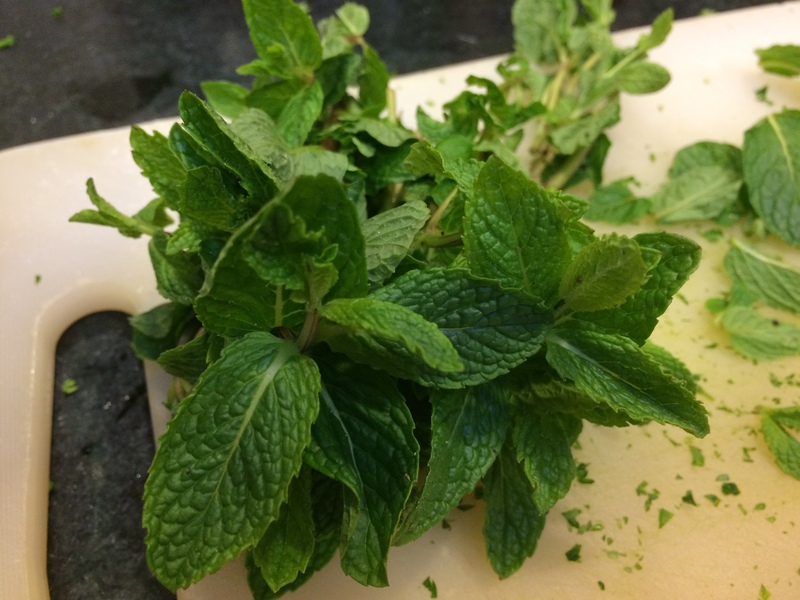 While the bulgur is soaking, rinse and spin-dry, then air-dry the herbs. Chop the tomatoes, lightly salt them and place them on a strainer to drain. Squeeze lemons for the juice. 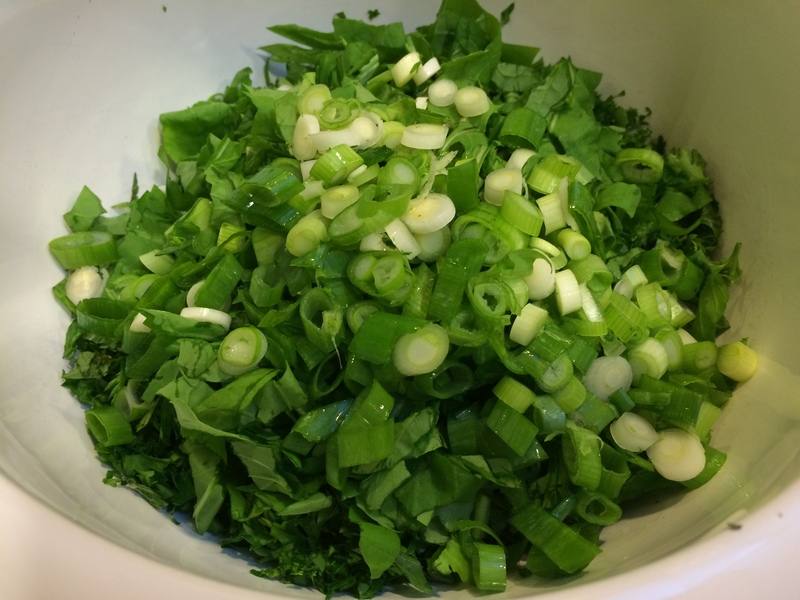 Finely mince the parsley, mint and scallions and collect them in a big round bowl. Add the tomatoes and the drained bulgur wheat. Pour on the olive oil. Toss to combine. At this point, stop to taste for salt and add the required amount. Pour on the lemon juice and mix nicely. Serve on lettuce leaf boats or as a side in a falafel meal. Let’s say you are a human being who has encountered a bean for the first time. I’m speaking of a bean with a hard shell, the kind that looks more like a pretty rock than anything to do with food. Your mission — find a way to turn it into food. What do you do? You could boil it, of course. Boil it and boil it and boil it. This will work, and you will get a nice mushy meal. Or you could keep that bean dry, and grind it into a fine powder. Then, you can use the resulting flour in all kinds of batters and doughs. This works too. What else? Well, some creative people in the middle east decided on a third route. 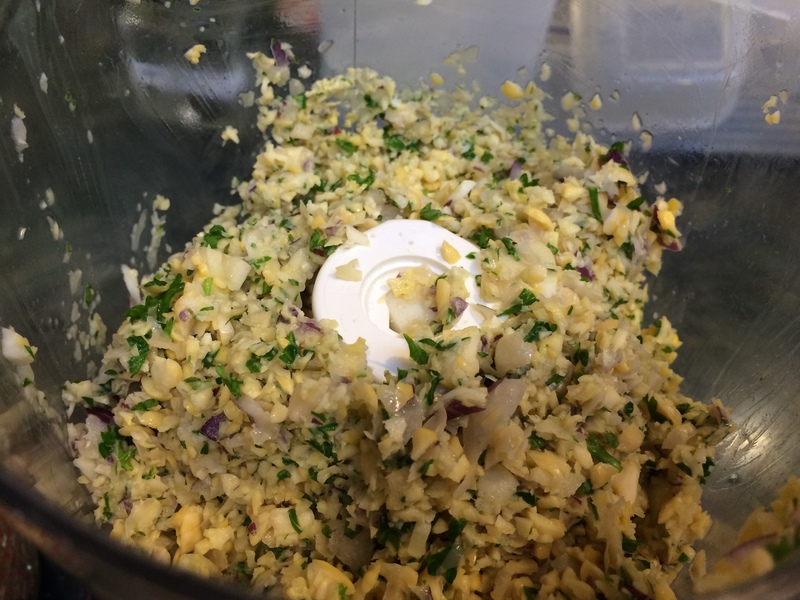 Soak it overnight, and when it is plumped up, grind it, and fry the resulting mash. This time it will be more like a dough that clumps together, rather than a fine powder, because the beans have drawn in all that water and gotten rather plump and soft with it. 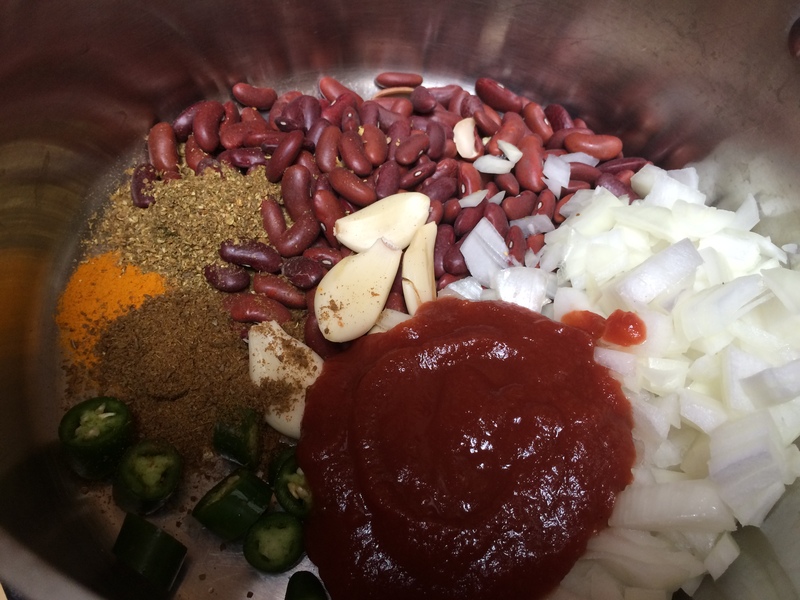 The only cooking the notoriously hard-to-cook bean will get is at the end, frying in a pan. Is that foolhardy? No, the soaking did most of the work. 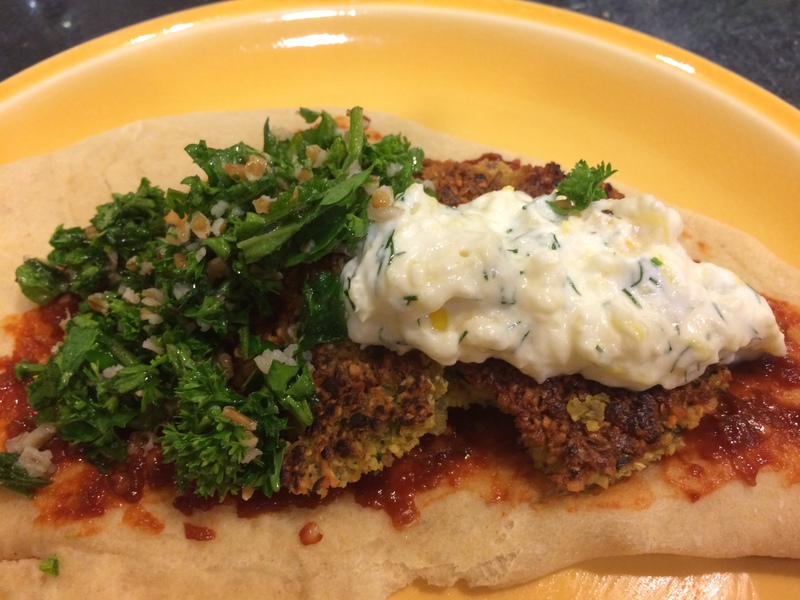 Well, well, falafel! That is what a falafel is, and the bean in question is the garbanzo bean (a.k.a. chickpea). 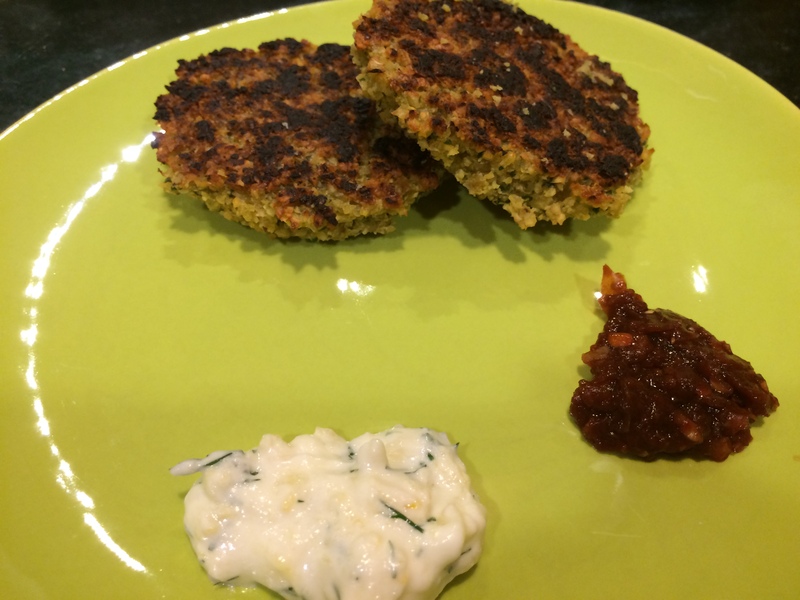 (Cooks in India discovered this trick also, but with a different bean: vadas are made by first soaking the split urad bean overnight and then wet-grinding it after). 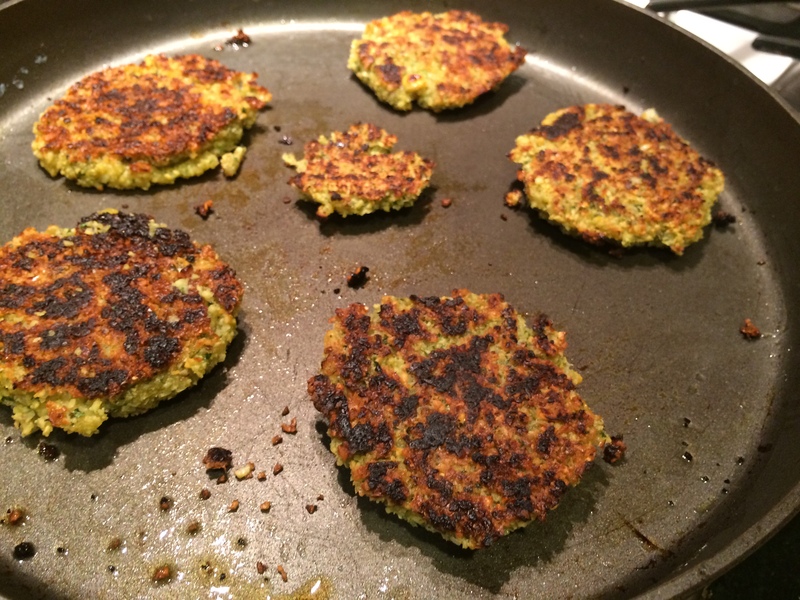 Falafel, though, is made out of the whole garbanzo bean, soaked overnight. 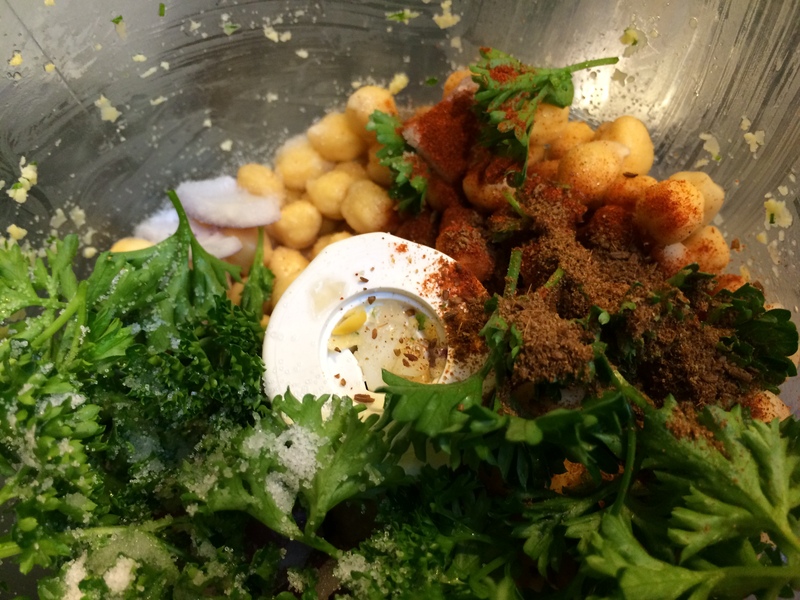 Parsley, onion and garlic are ground up along with the garbanzo for flavor. The resulting mash is bound with flour, or left as is. Balls made of this mash can be deep-fried or, as I did, patties formed in one’s palms can be shallow-fried. The result — an outside surface that is crunchy and satisfying, while the insides are still pliable and savory to the hilt. Now you will agree that this is a pretty neat invention. Nifty, even. Tucked inside a pita bread, drenched with chili pastes and salads and strong stuff like onion, it makes a convenient item to eat while holding in one’s hand without ceremony. This is why falafel is known as the king of street food all over the middle east. San Francisco has its own share of immigrants from all over the world, and of course we have our share of falafel food trucks and hole-in-the-wall restaurants. 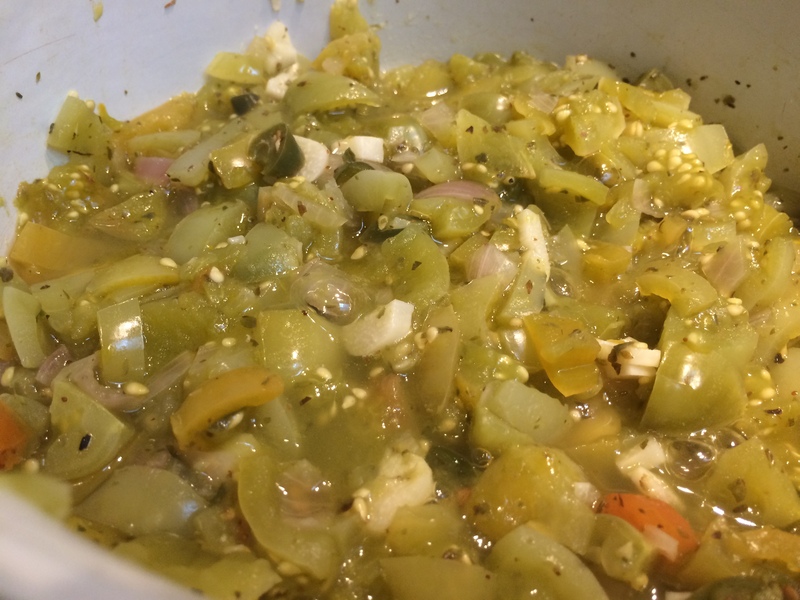 Some are famous for their hot sauces, others for their pita, and yet others made their name for the pickled or fried vegetables that they tucked into the pita pocket. Some serve falafel not as a sandwich or a wrap, but as one of a platter full of appetizers known as mezze. (This word, by the way, comes from the Persian mazze, the root of the Hindi mazza, meaning ‘fun’). One particular restaurant that ran for years near Haight Ashbury — and one that I sorely miss — served their falafel this way, on a giant brass platter with embossed designs, while you lounged on floor cushions and smoked flavored hookahs, and watched a raucous belly dance. Much as I love falafel, that was not the highlight of this particular establishment — it had so many others. 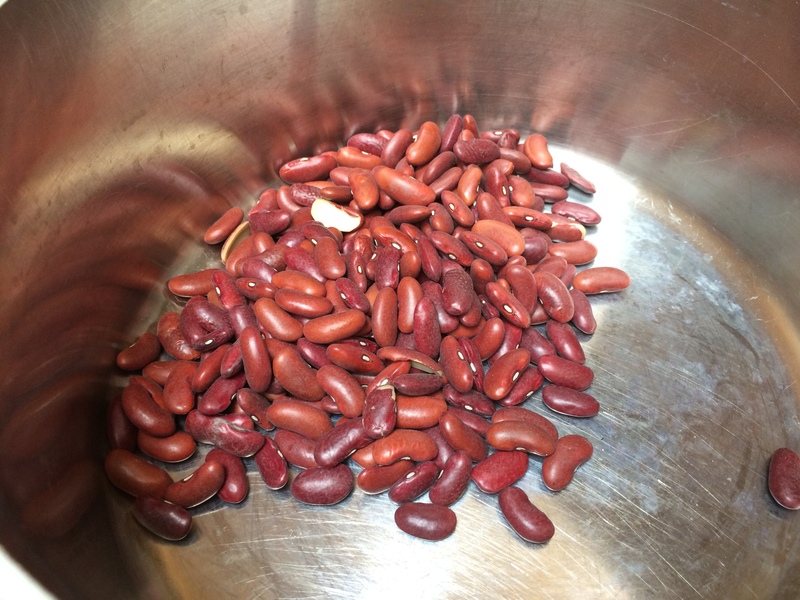 Soak the beans overnight in four cups of water. The next day, they will have swelled enough to fill up almost the entire container. Drain and rinse. Roughly chop the onion and garlic. 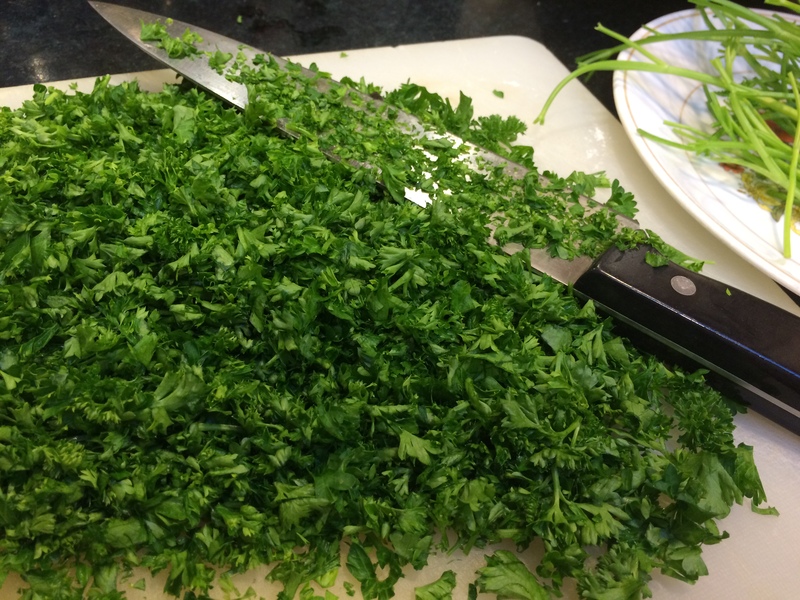 Rinse, dry, and take tough stems out of the parsley. Put the beans and vegetables into a food processor, but make sure that everything is well-dried — one does not want extra liquid in the mash. Add salt and the optional spices. I needed two batches of processing. The resulting mash should be able to clump together, and yet, not be dripping with liquid. At this point, you can add a tablespoon or two of dry flour if you like to bind it. I skipped this step. When you are ready to fry, get a wide, thick-bottomed pan, preferably non-stick, nicely hot. Add oil generously. Spread oil on your hands and form the patties within your palms. You will need about a golf-ball sized amount of mash for one patty. Lay it flat on the pan. It will sizzle. Press it flat with a spatula. When the underside seems browned (this will take about five minutes on medium-high heat), put a few drops of additional oil on the top (uncooked) surface of each and flip each gently. Another five minutes and you are done. Alternatively, you can form balls and deep-fry them. You should make doubly sure that the mash is binding well with the added flour if this is your approach. 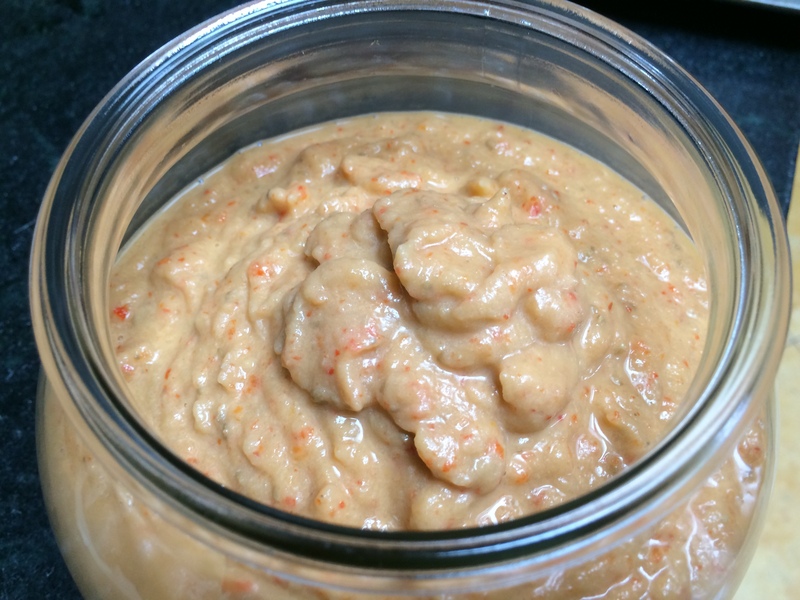 I submitted this recipe to the Virtual Vegan Linky Potluck!